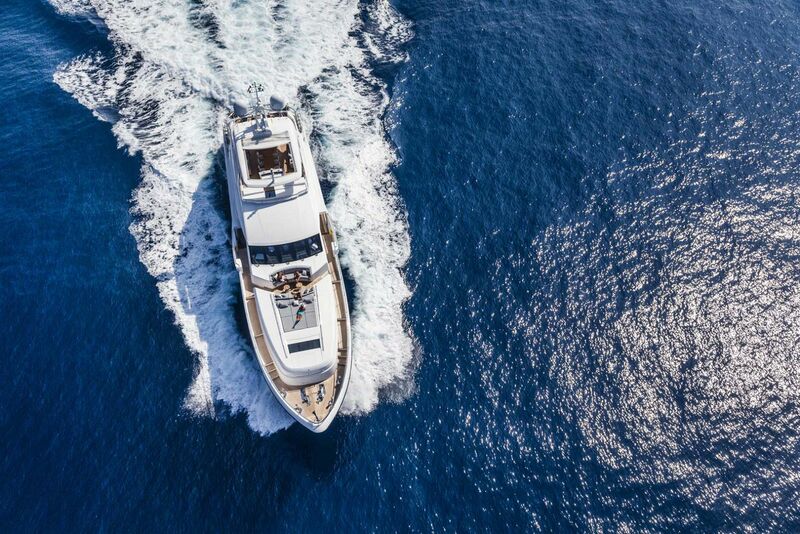 After five hulls delivered, including the spectacular Anka known for her turquoise blue hull color, the Princess Yachts 40M has become a popular option for owners wanting the advantages of a production yacht with the ability for a certain amount of personalization that a custom yacht design provides. 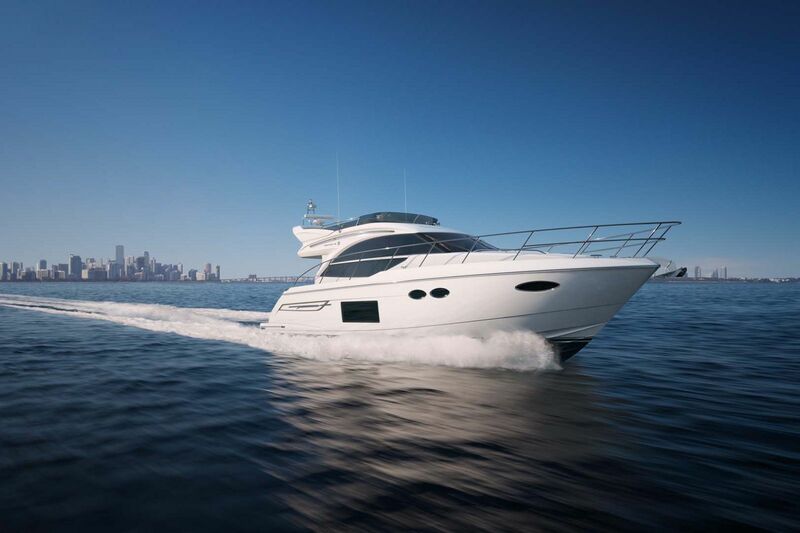 The Princess factory and its network offer confidence to buyers that not only will the re-sale value hold on their new Princess, but the dealer and service network to take care of their customer’s needs it second to none. 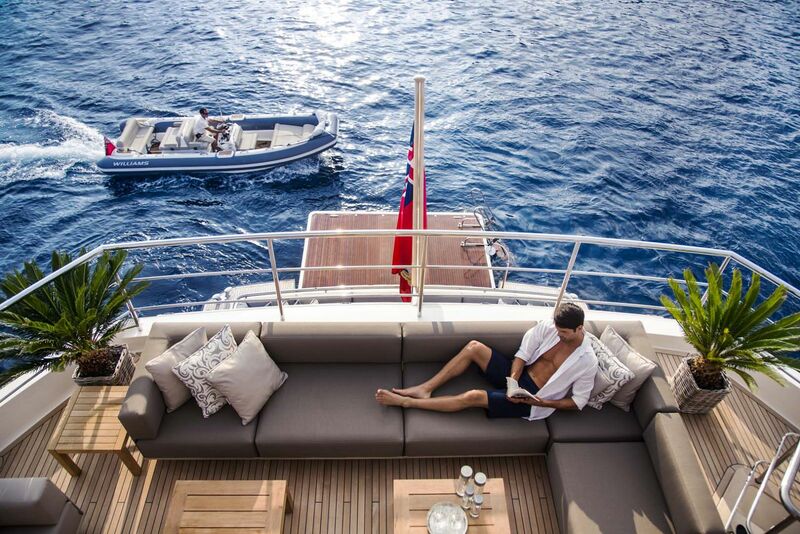 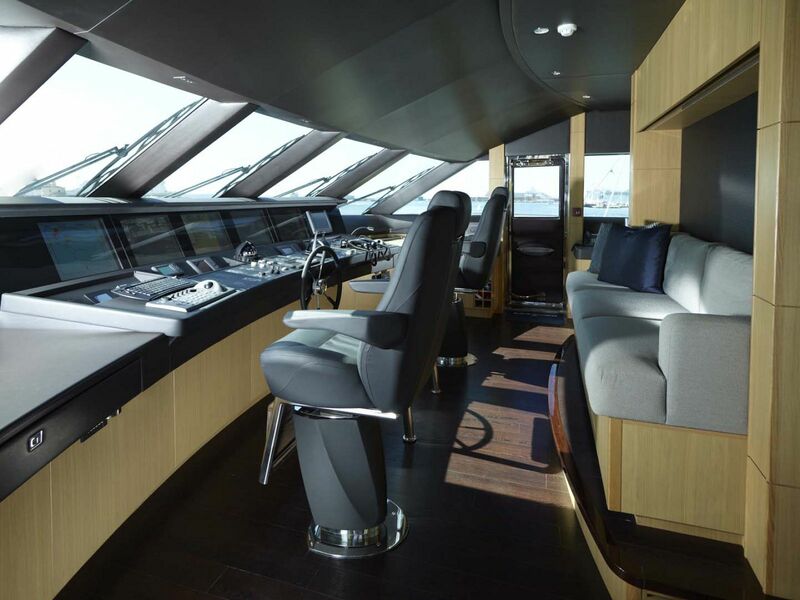 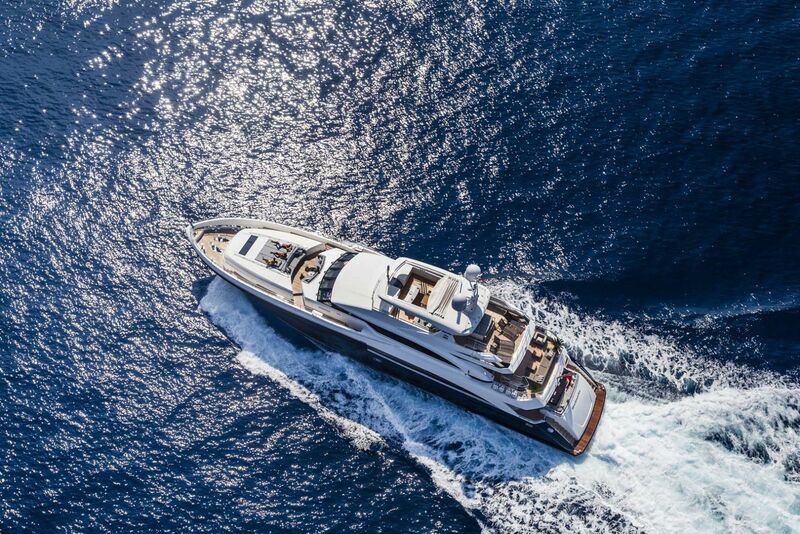 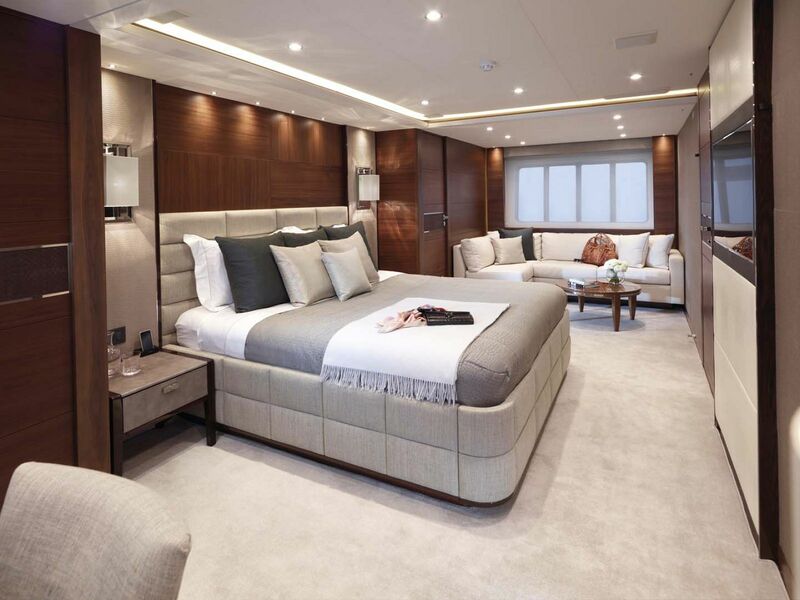 The Princess 40M is the ideal long-range tri-deck cruising yacht for its technically advanced construction and design, luxurious interior accommodations, and the quality control that only the Princess factory in England could achieve. 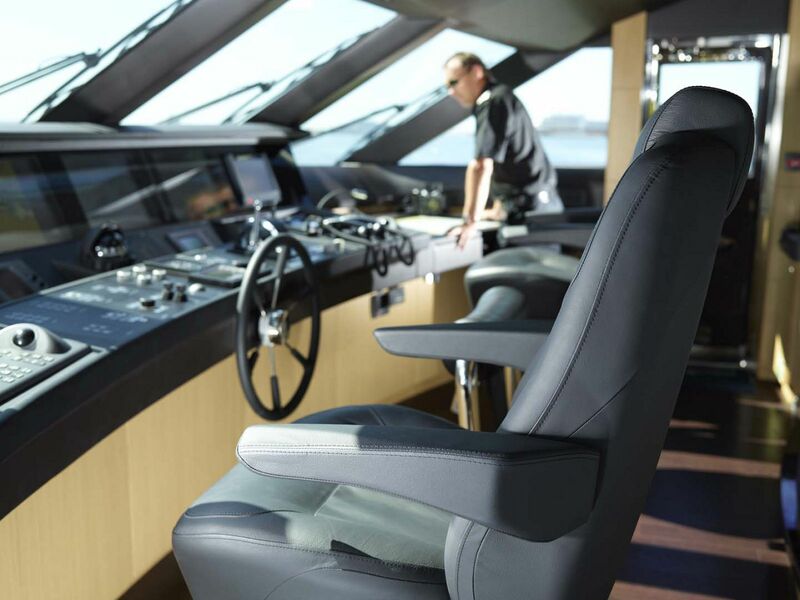 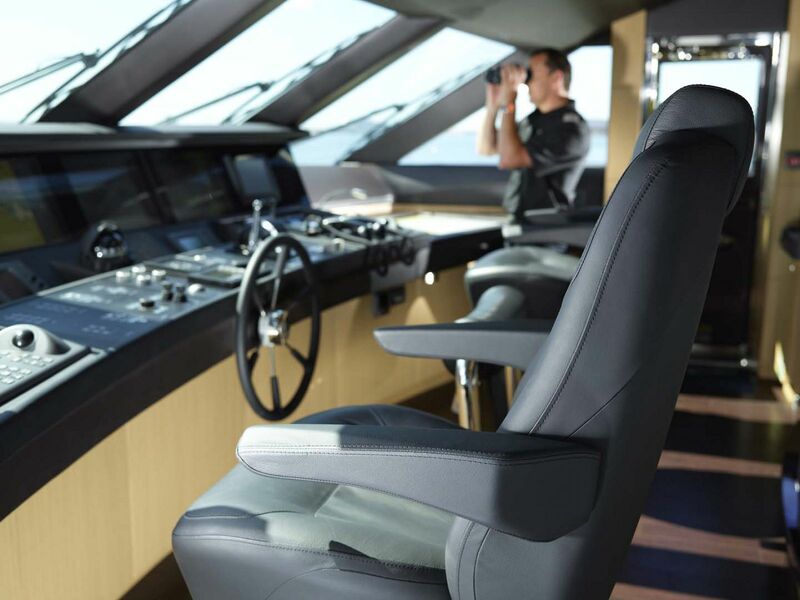 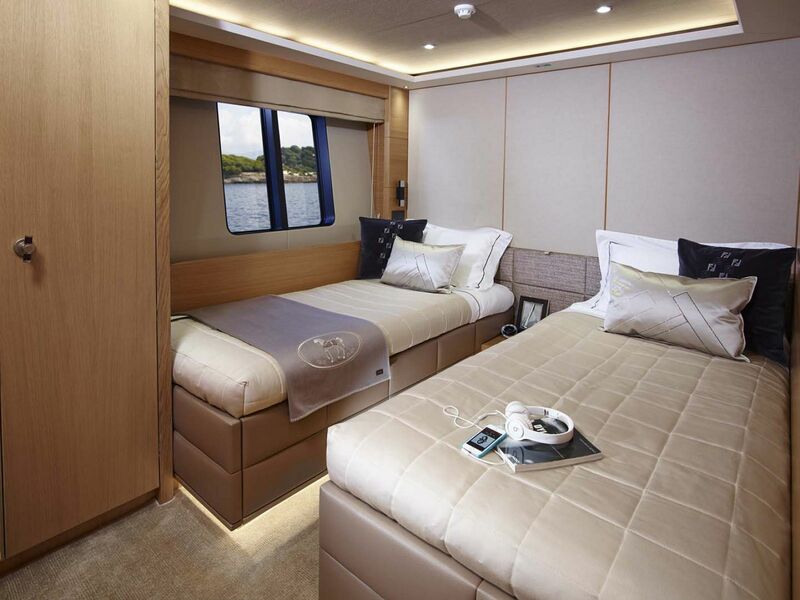 Over 200,000 man hours and 24,500 square feet of composite material went into the design and build of the first Princess 40M. 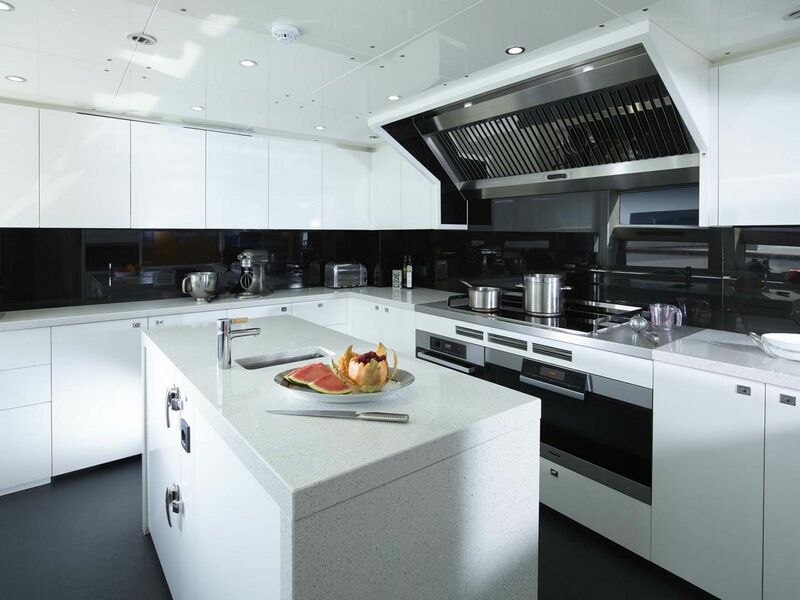 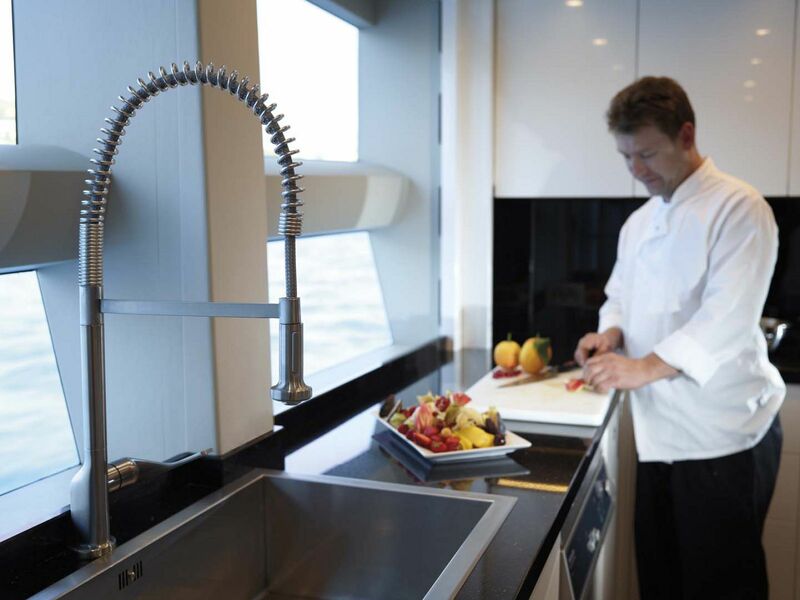 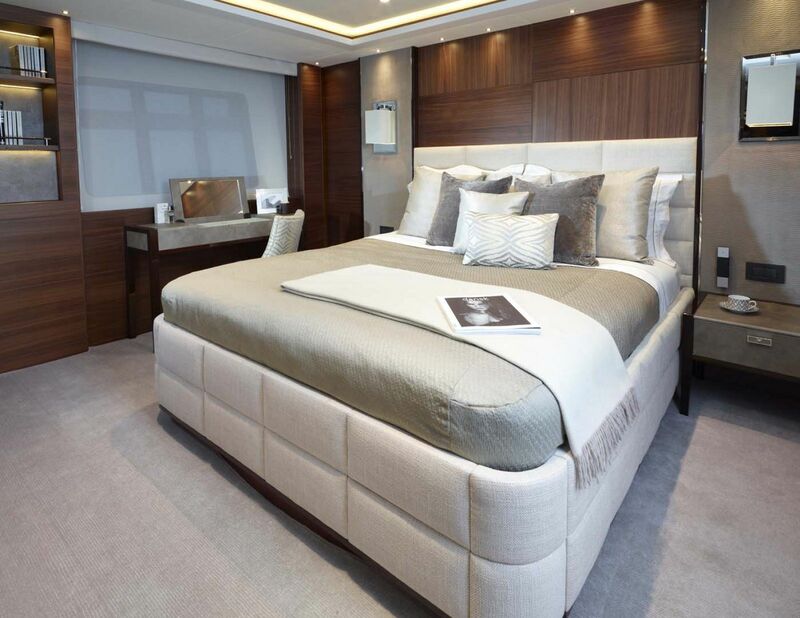 As with all Princess Yachts, the construction process is state-of-the-art with the finest machinery and the most skilled craftsmen in the world. 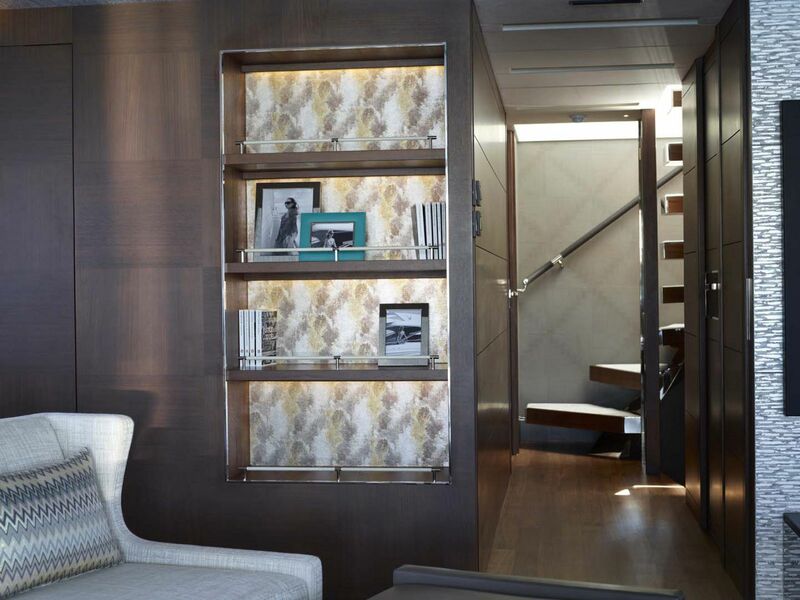 The entire hull is resin-infused resulting in a strong platform, but lighter weight for better performance. 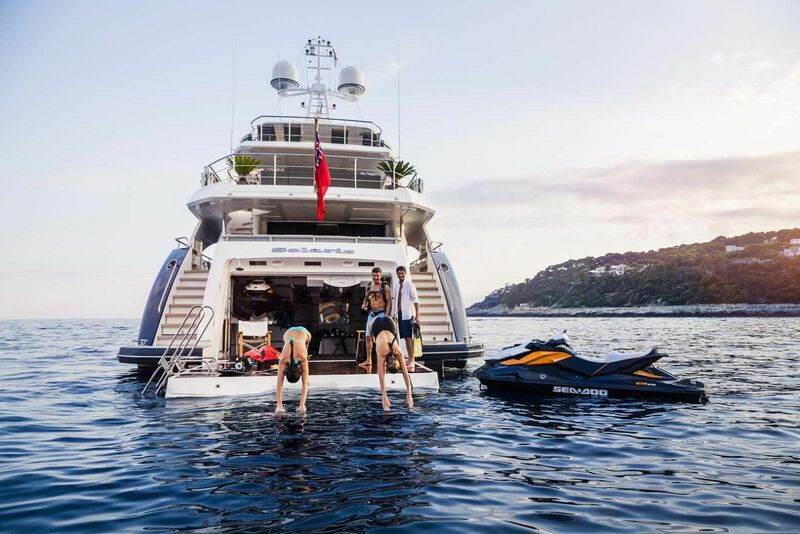 Starting at the rear of the yacht, there is a 10’ swim platform adjacent to the tender and toy garage that is cleverly known as a ‘teak beach club’. 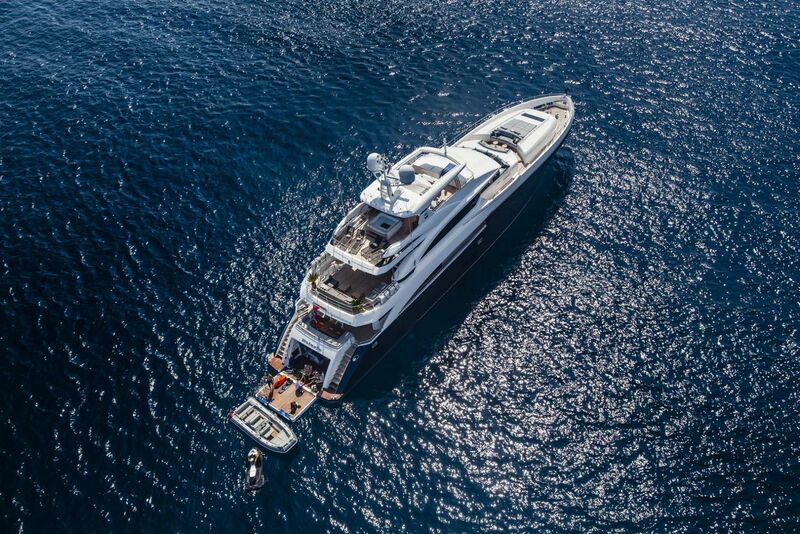 Owners have the opportunity here to use the swim platform to lounge in the sun or as a place to launch into the water with scuba gear. 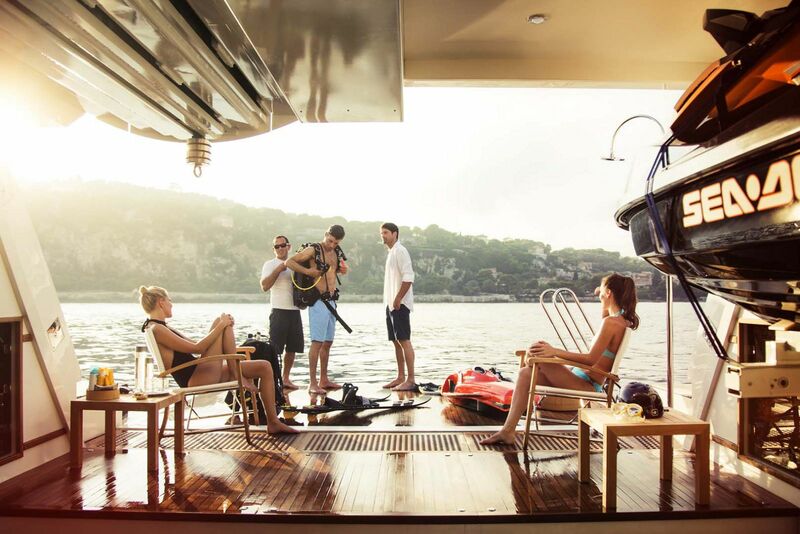 The garage has plenty of room for a tender, jet ski’s, diving equipment, and all of your water toys on board. 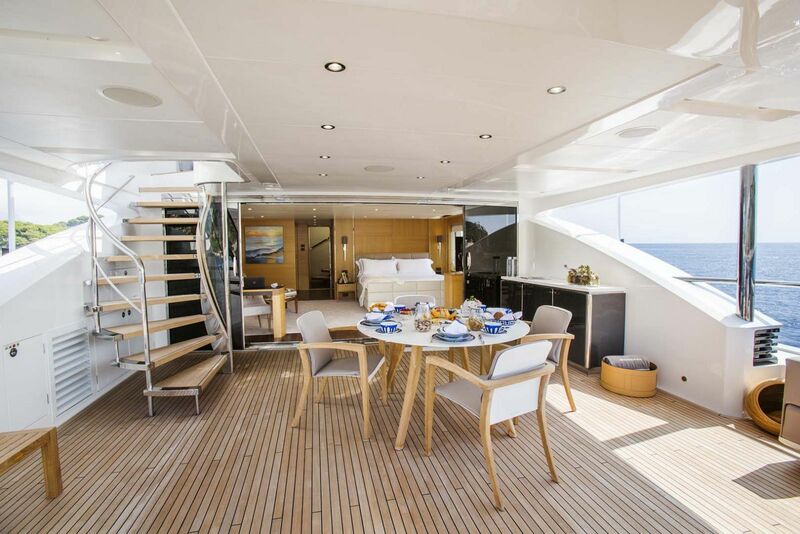 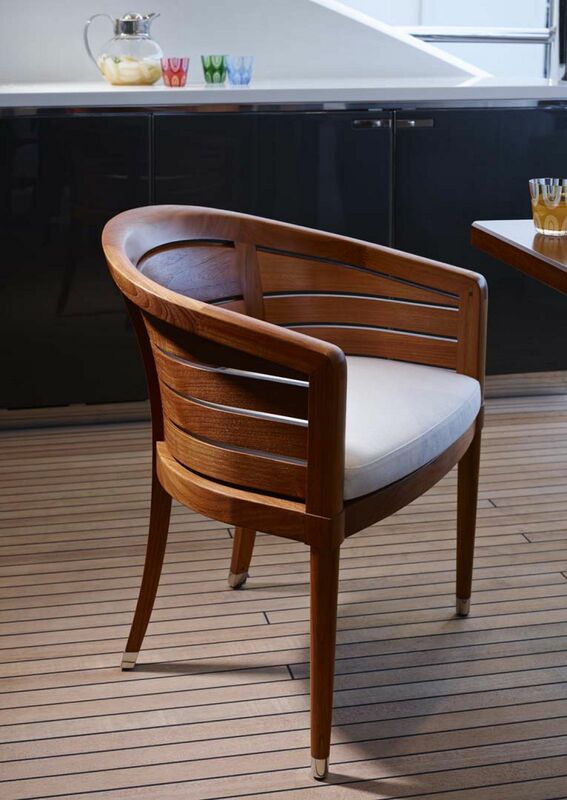 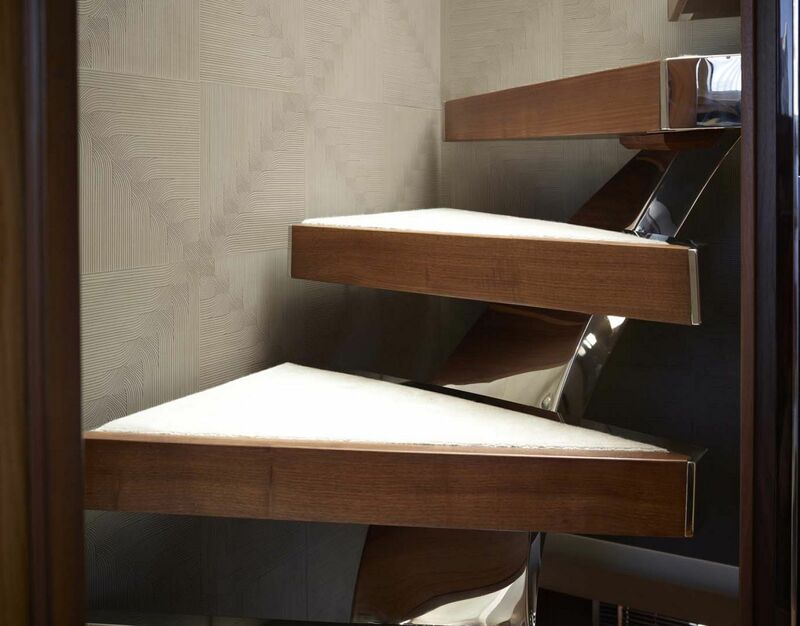 Teak staircases lead up both sides from the garage to the amazing aft cockpit which features U-shaped seating with two pedestal tables for al fresco dining along with a convenient wet bar. 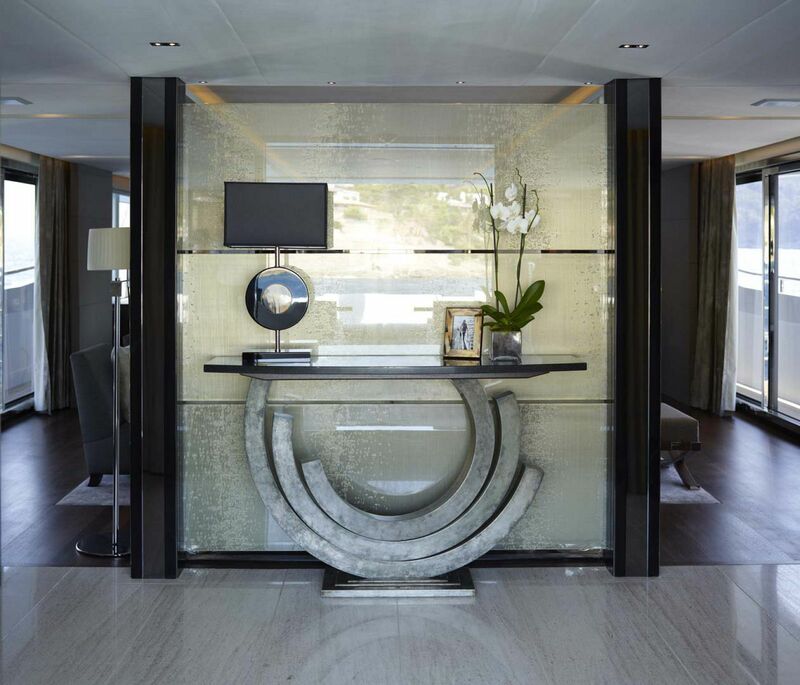 As you walk in through the salon, guests are welcomed with a small lobby which can make a perfect greeting area for large parties or gatherings in the salon. 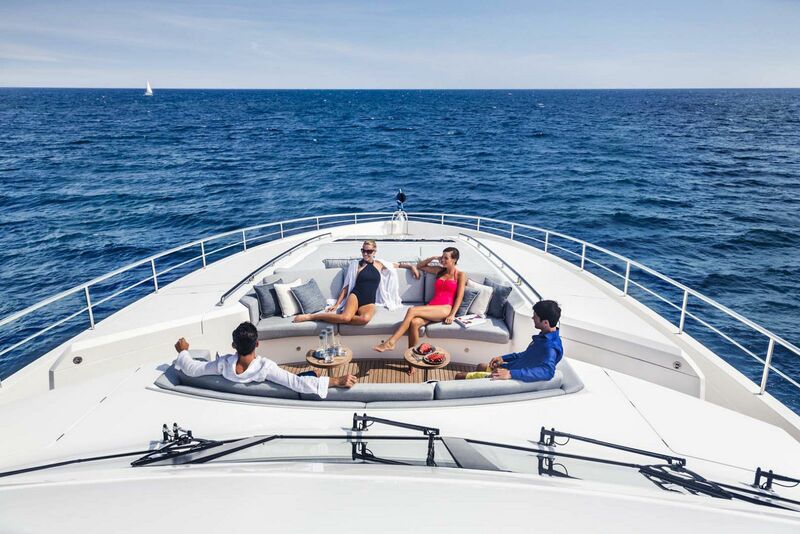 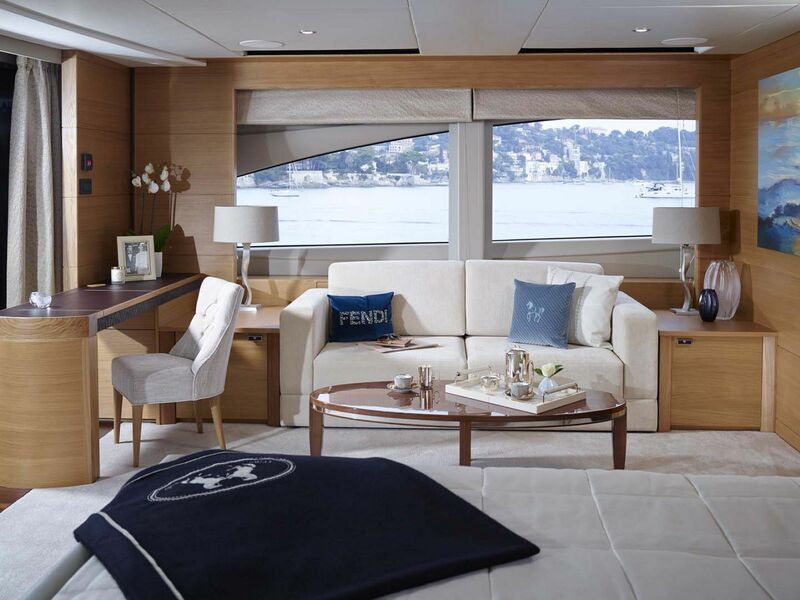 The beam of the Princess 40M is 26’ 4” which gave the designers the opportunity to create spacious, open rooms, but Princess took this space a step further by adding port and starboard balconies that drop down and create an outside patio literally on the side of the yacht. 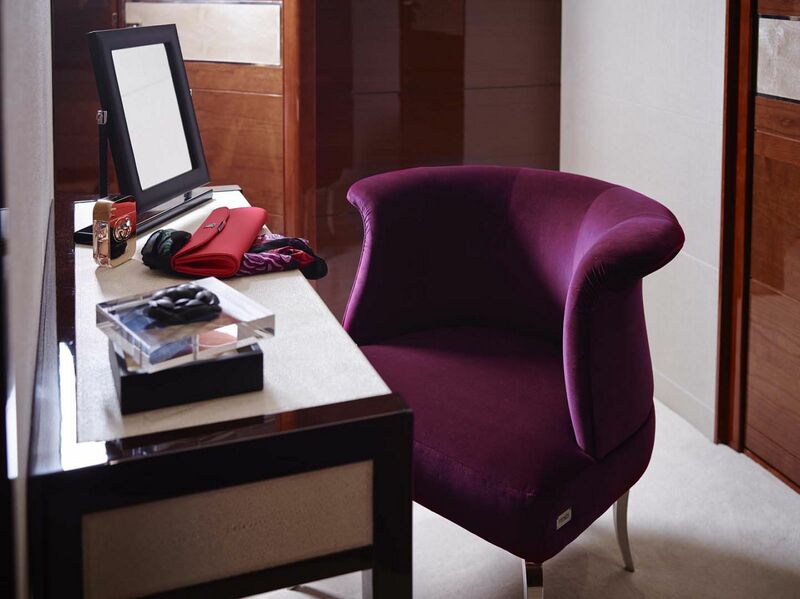 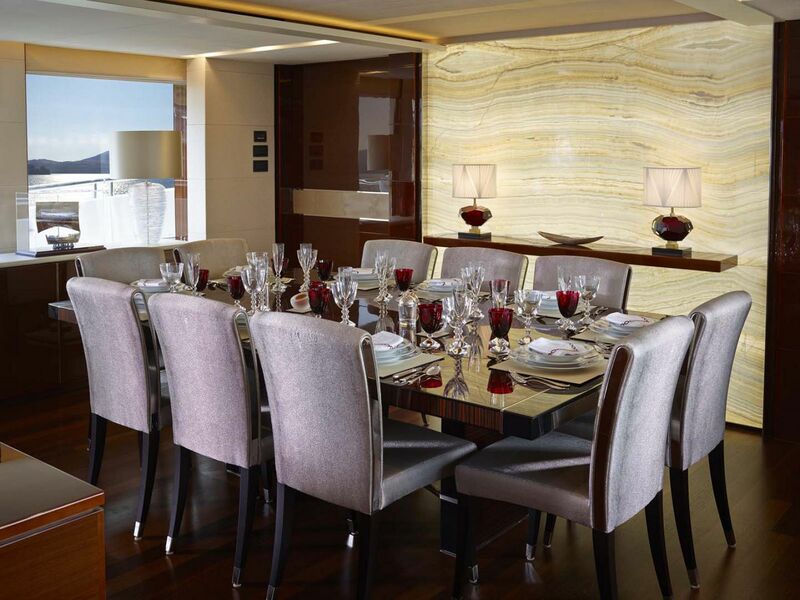 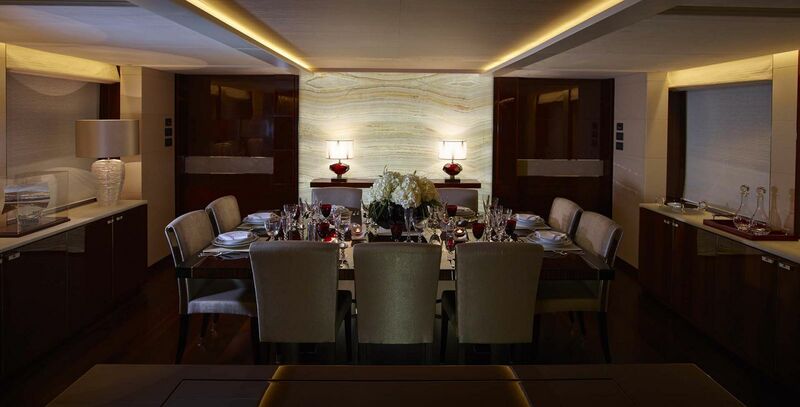 Adjacent to the salon seating is the formal dining area which can comfortably seat eight people. 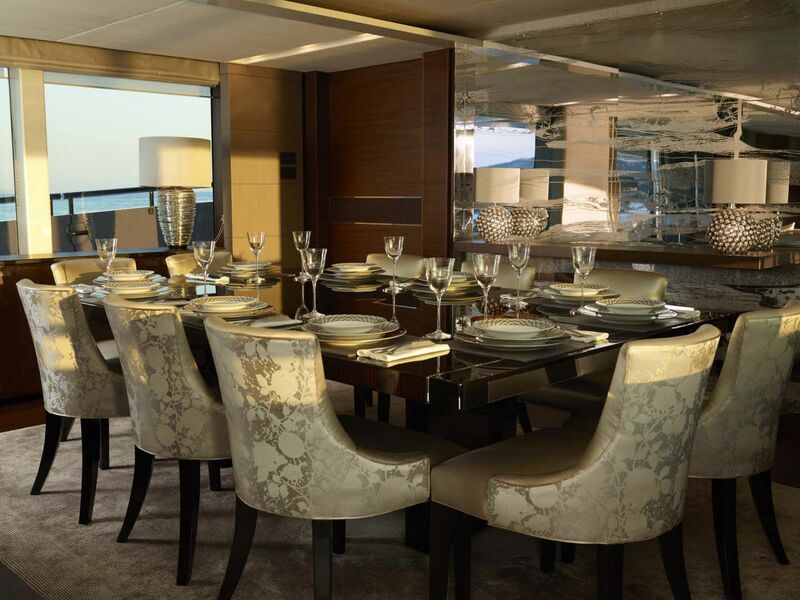 The panoramic windows in the dining space provide excellent views and there is plenty of room for serving and pouring cocktails. 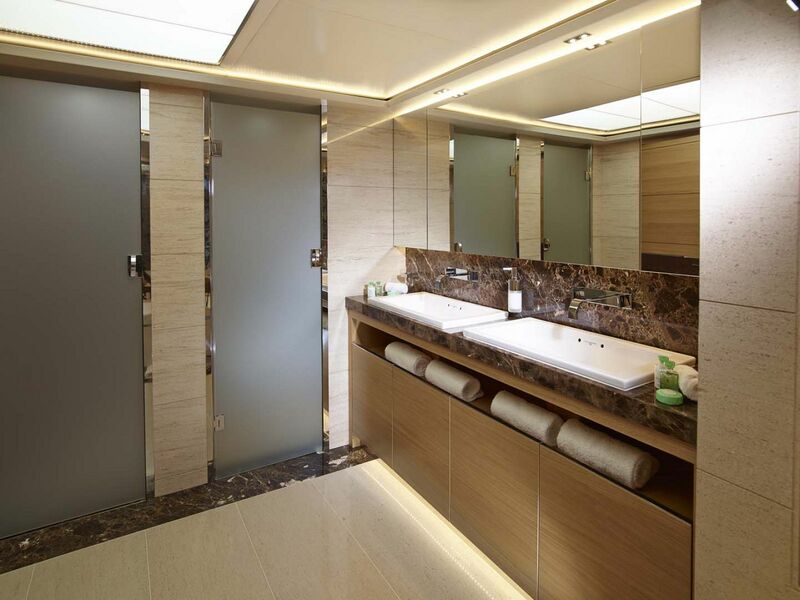 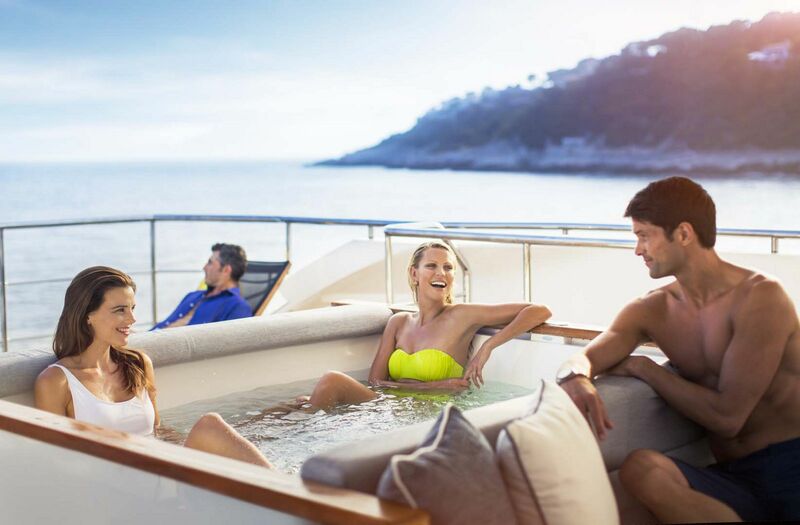 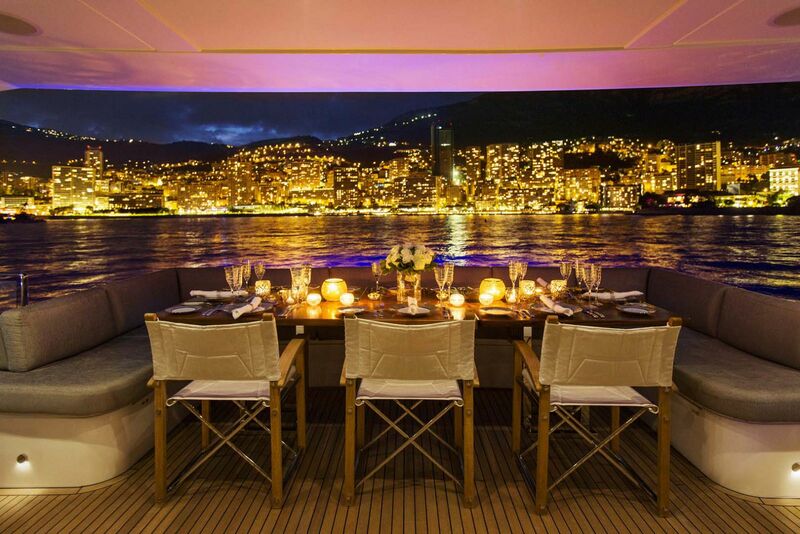 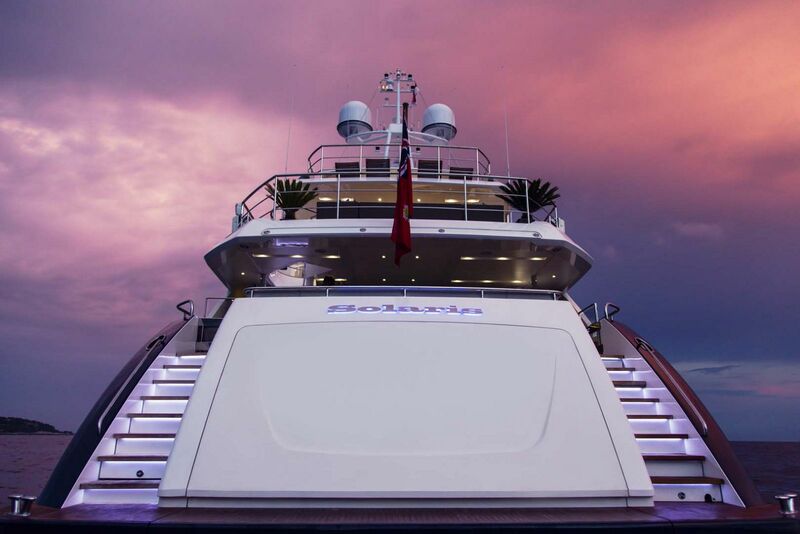 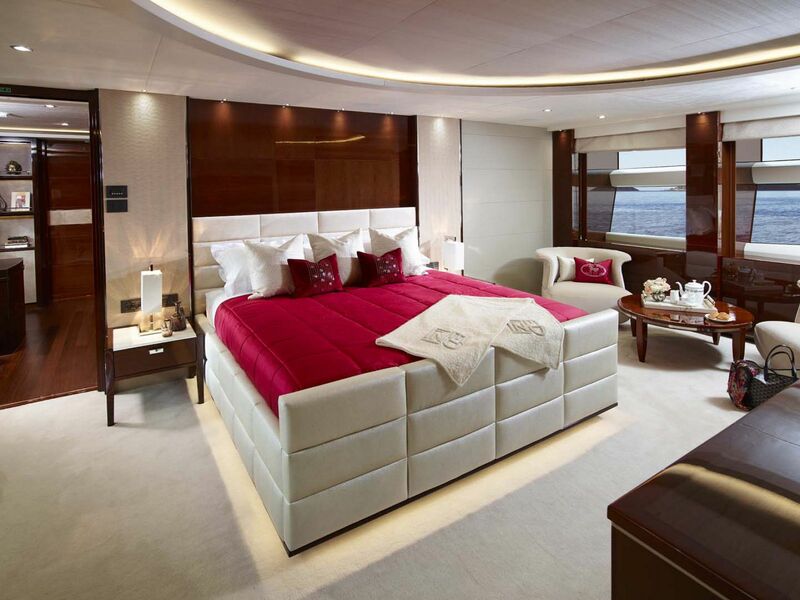 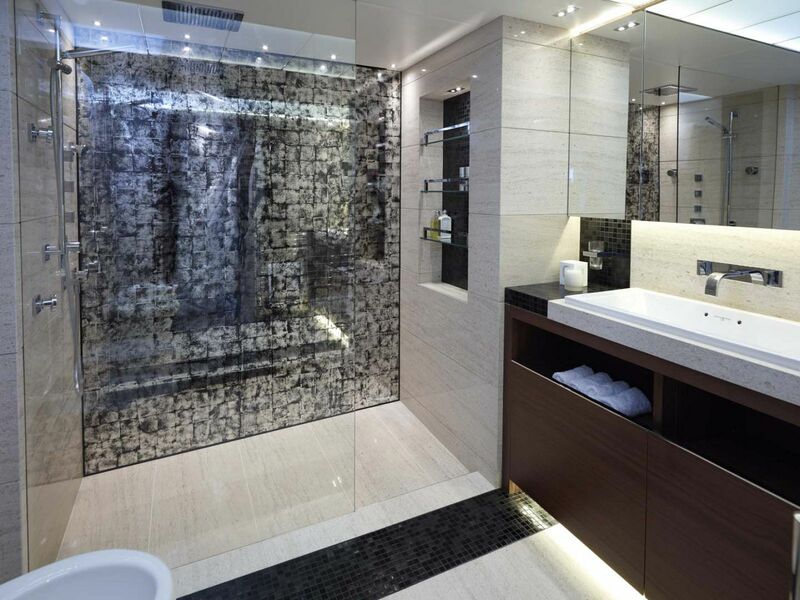 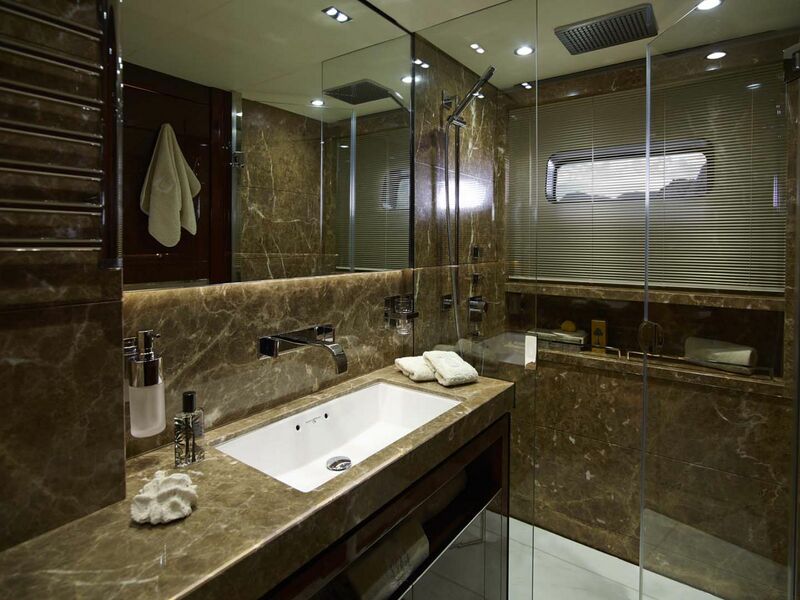 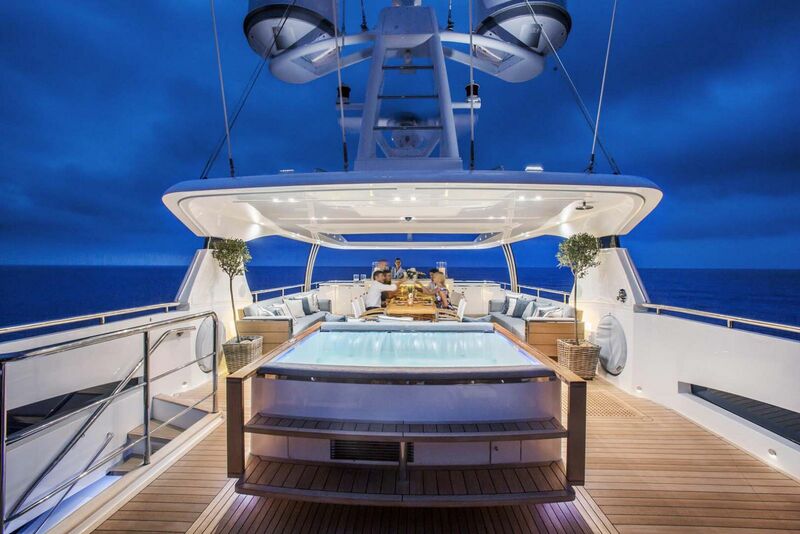 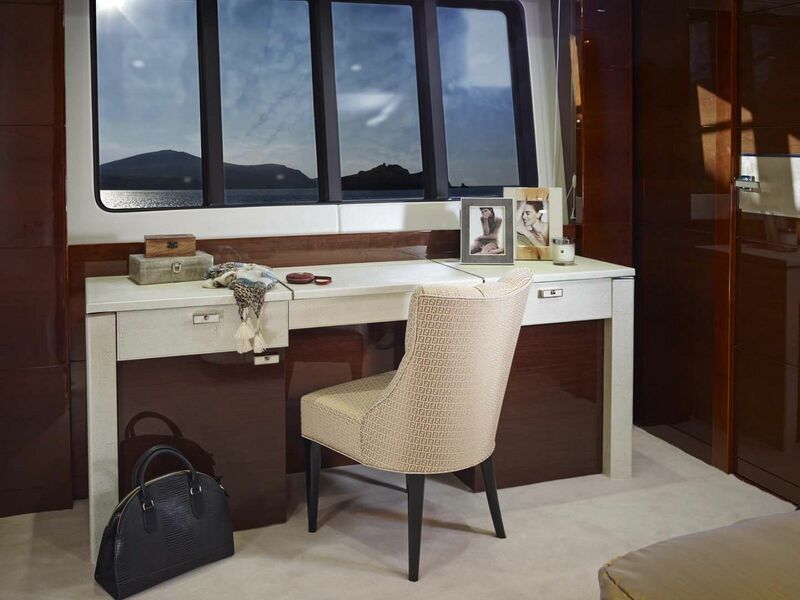 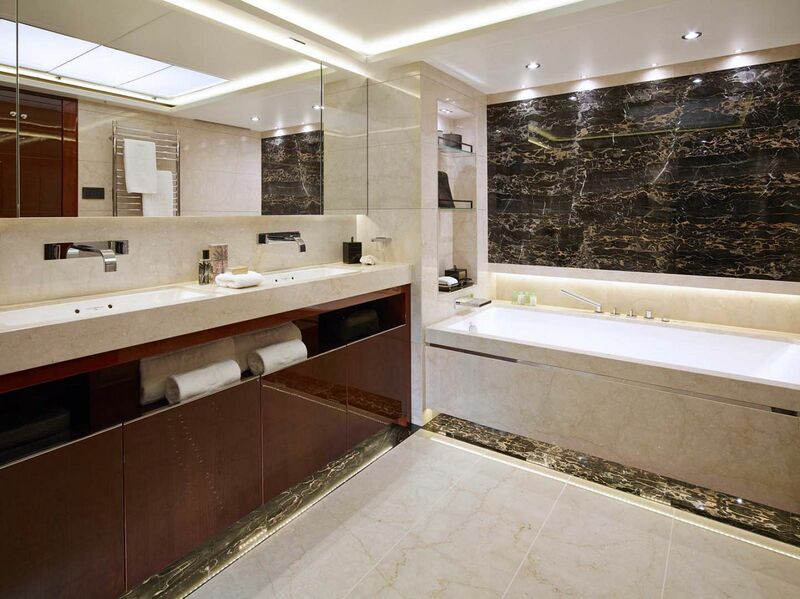 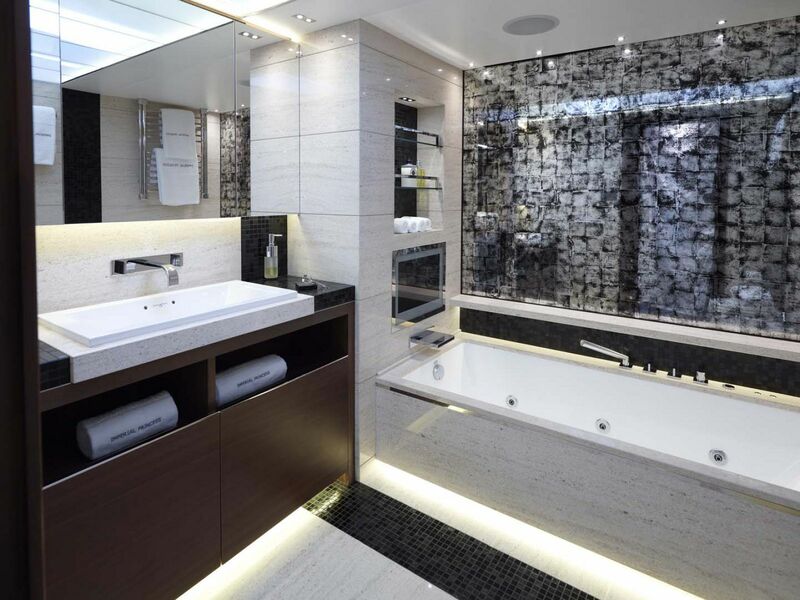 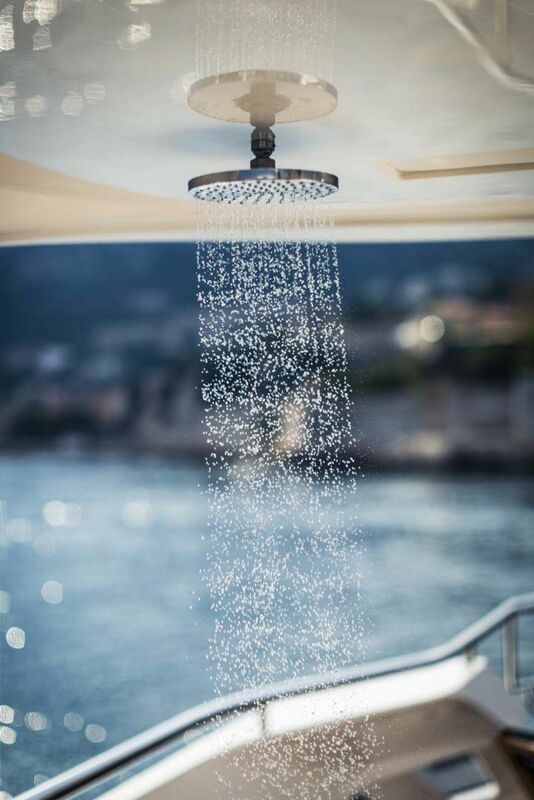 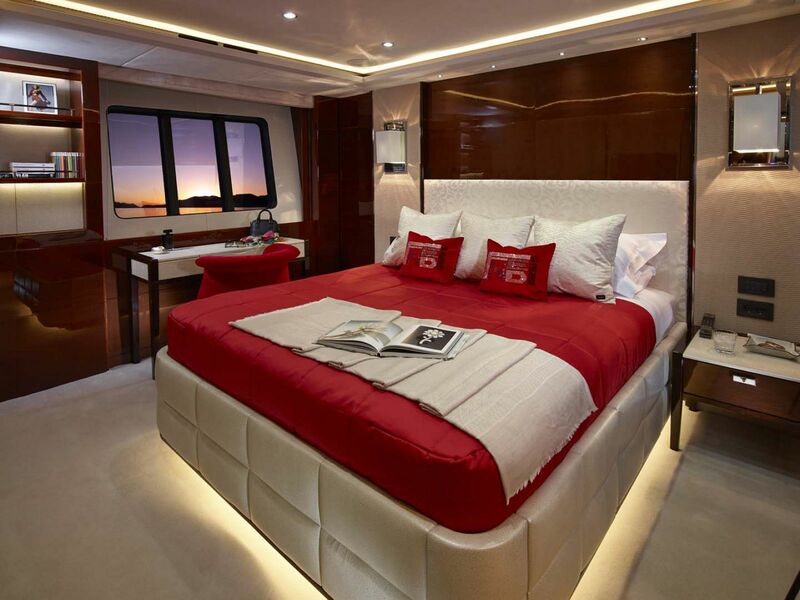 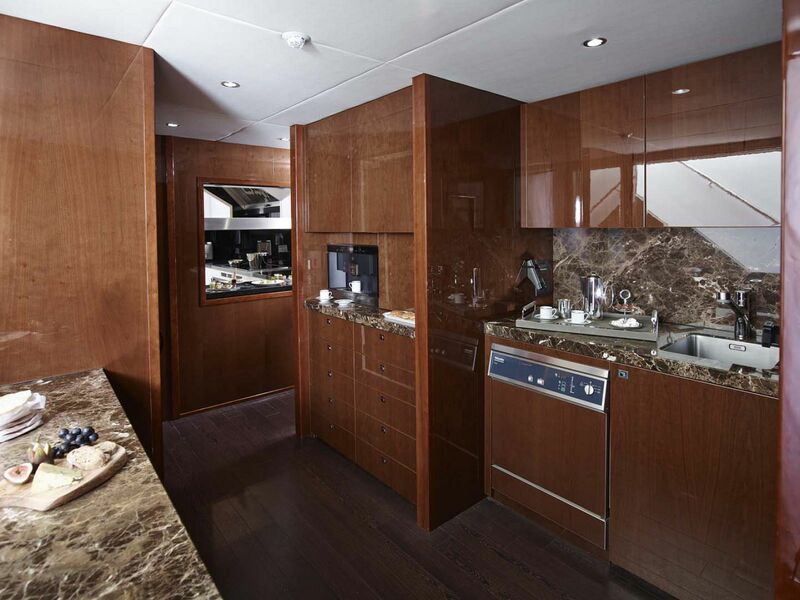 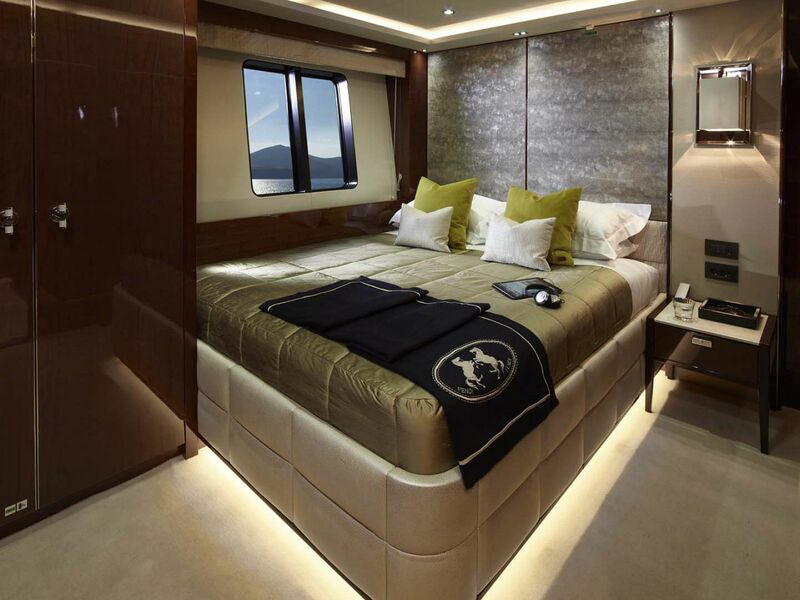 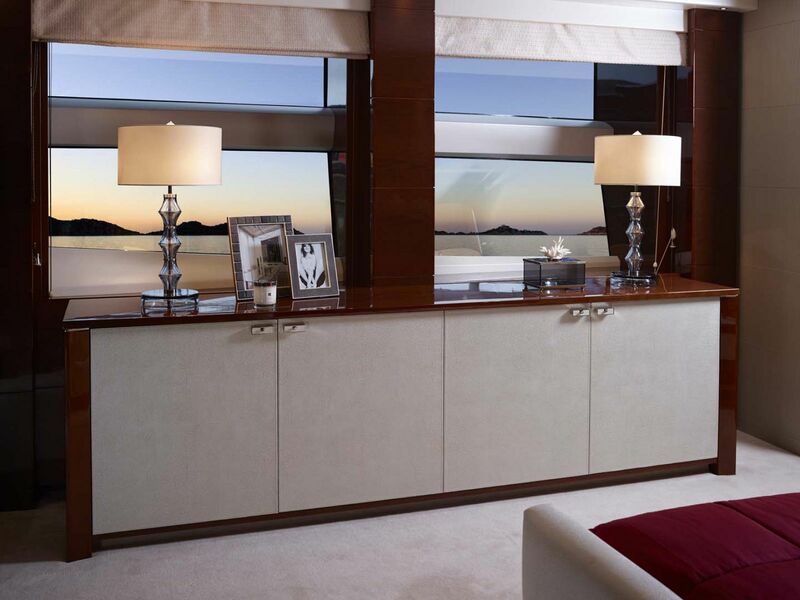 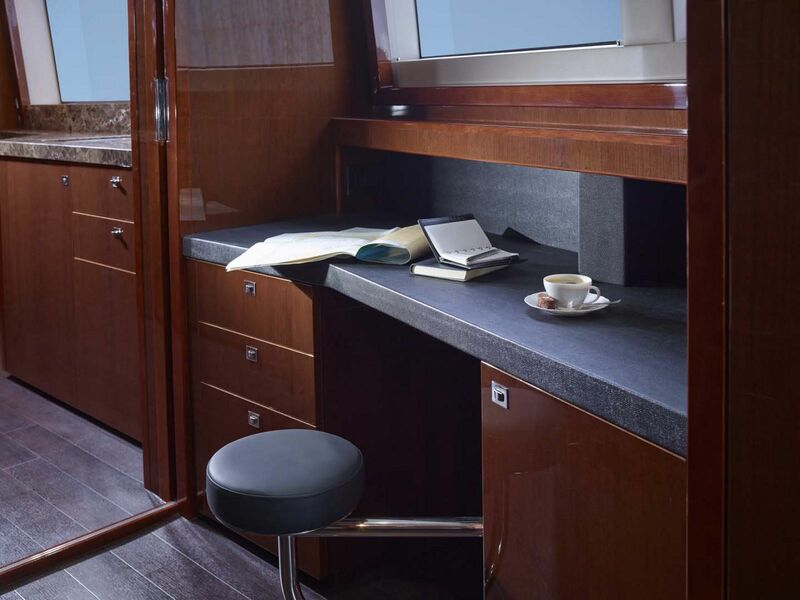 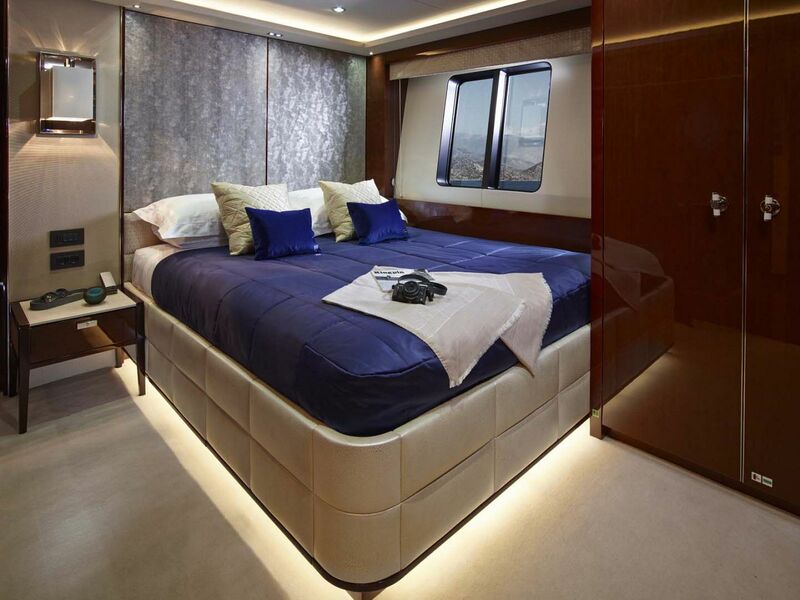 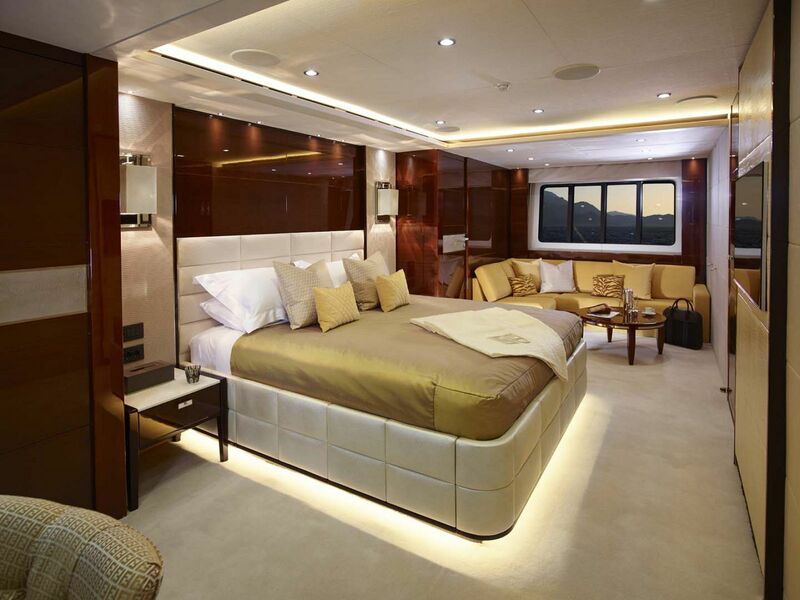 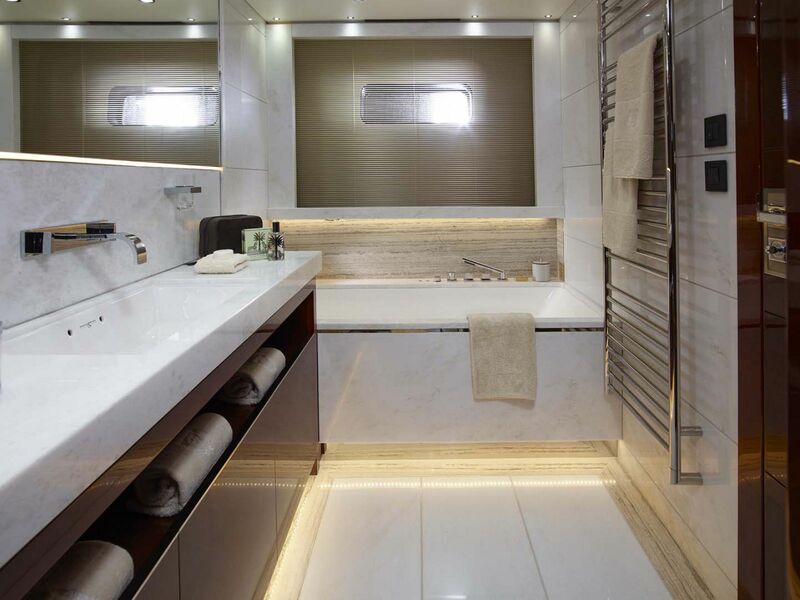 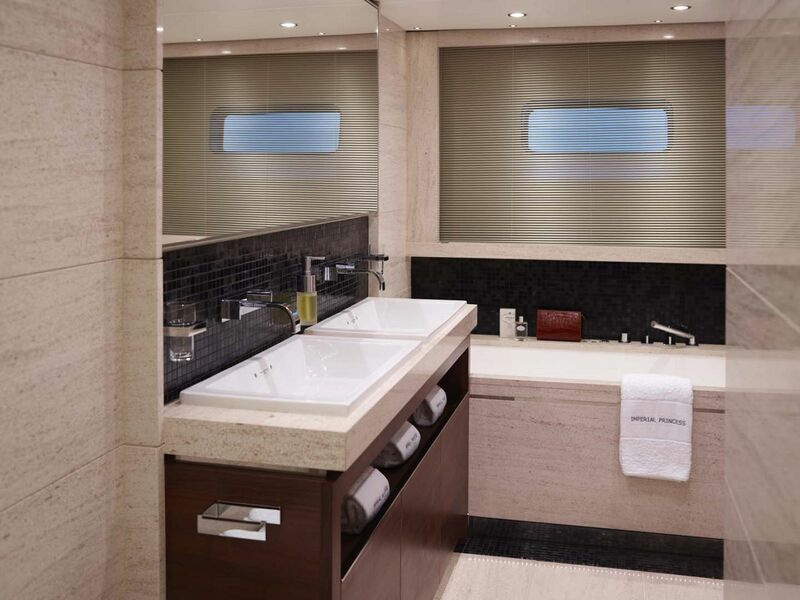 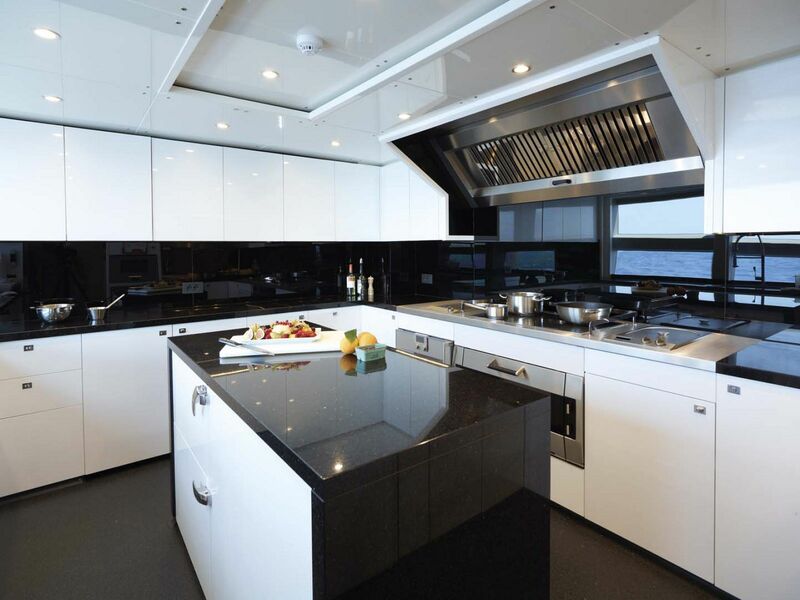 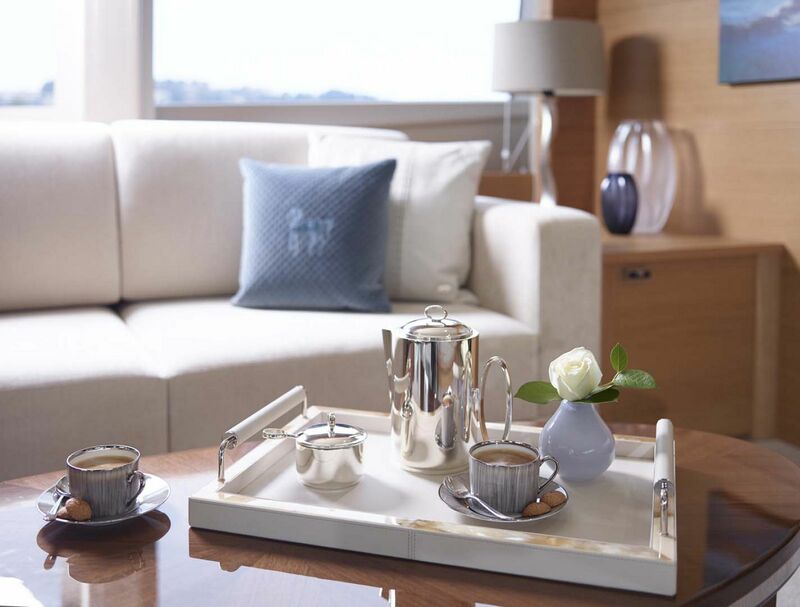 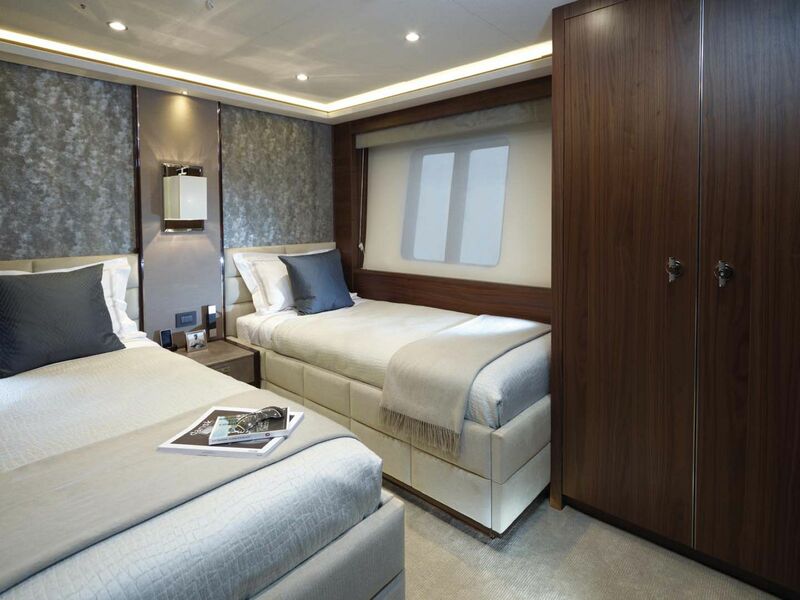 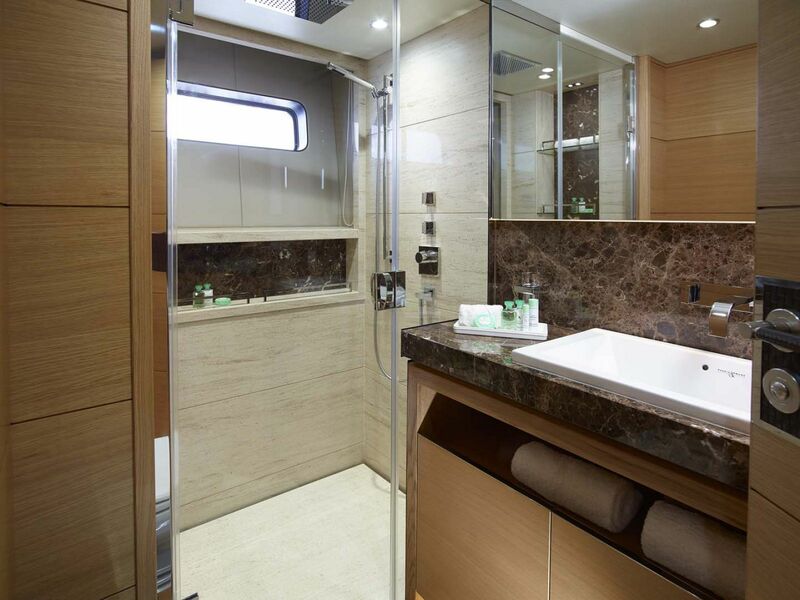 Overnight accommodations on the Princess 40M will have guests never wanting to leave. 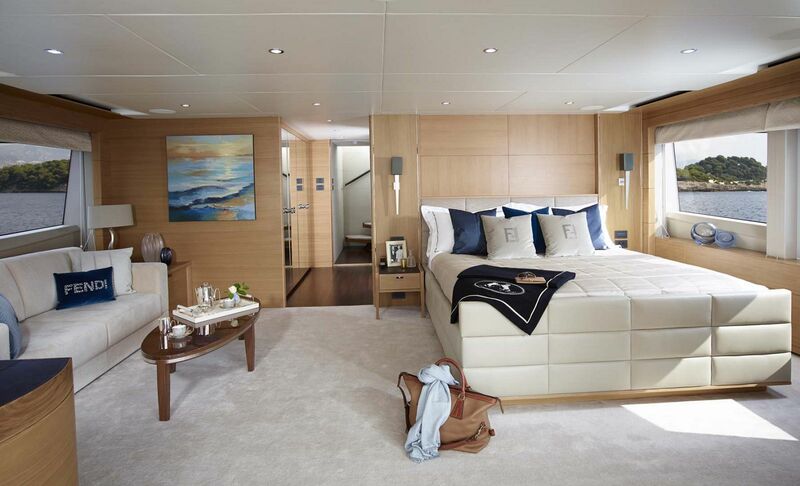 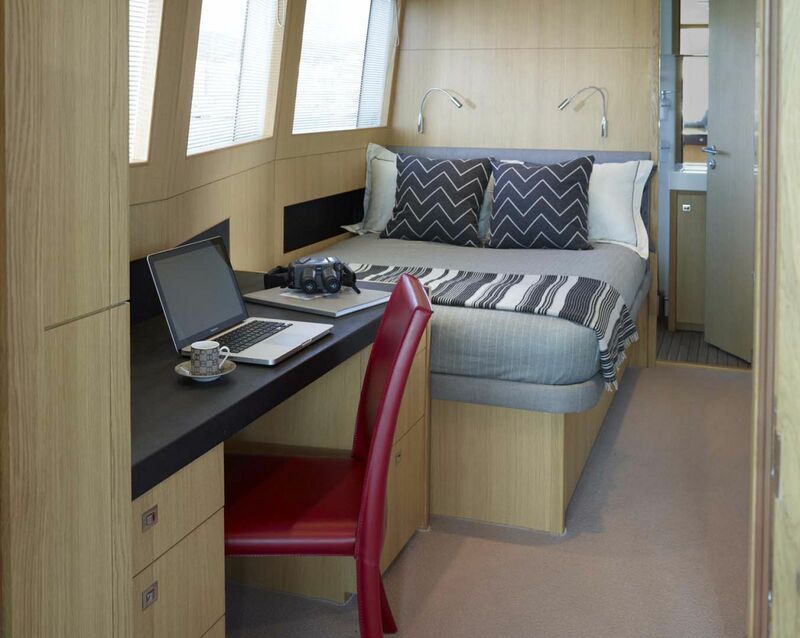 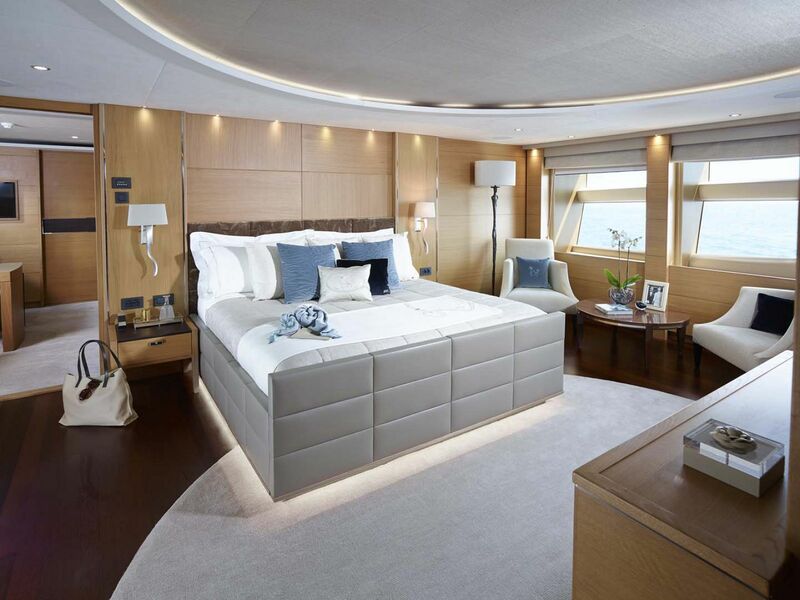 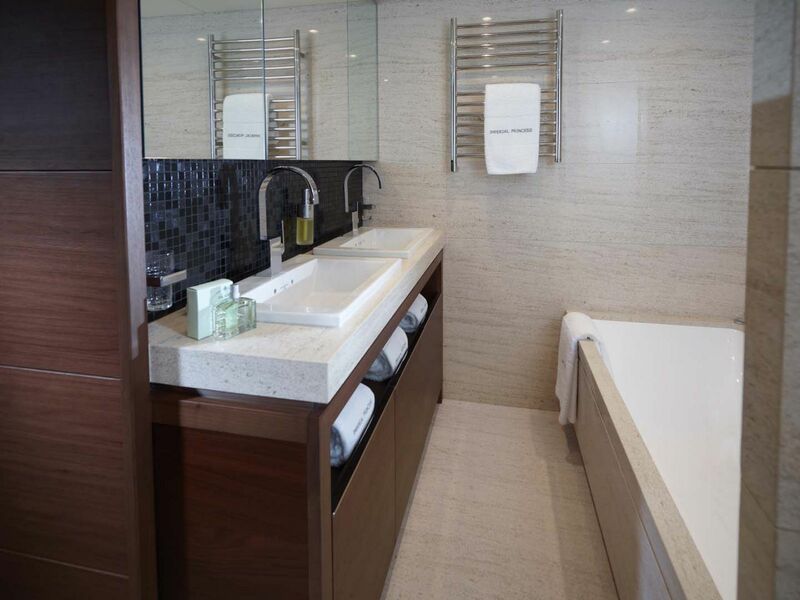 The standard layout offers five staterooms each with their own en suite head that can sleep 12 guests. 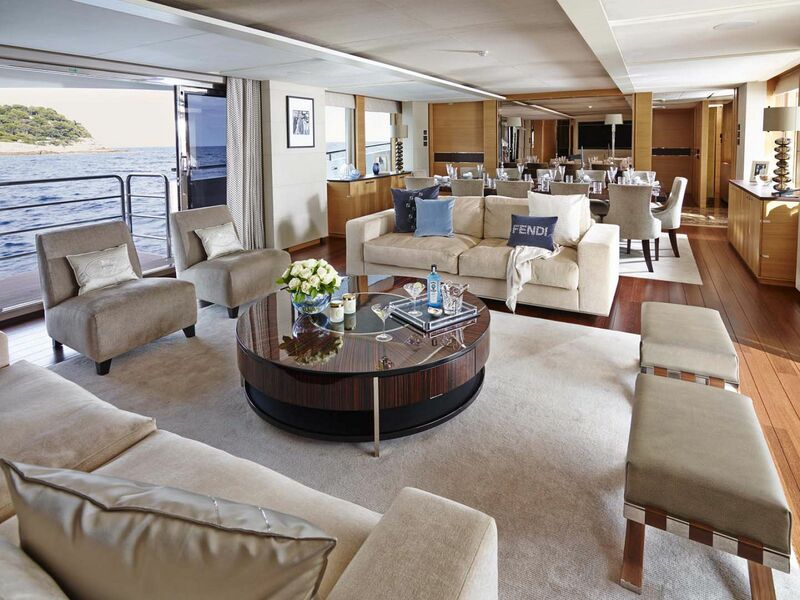 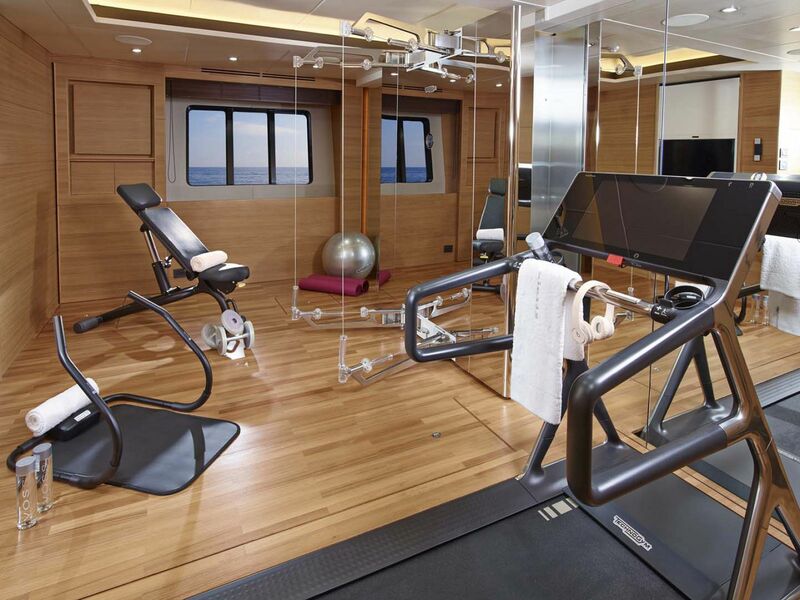 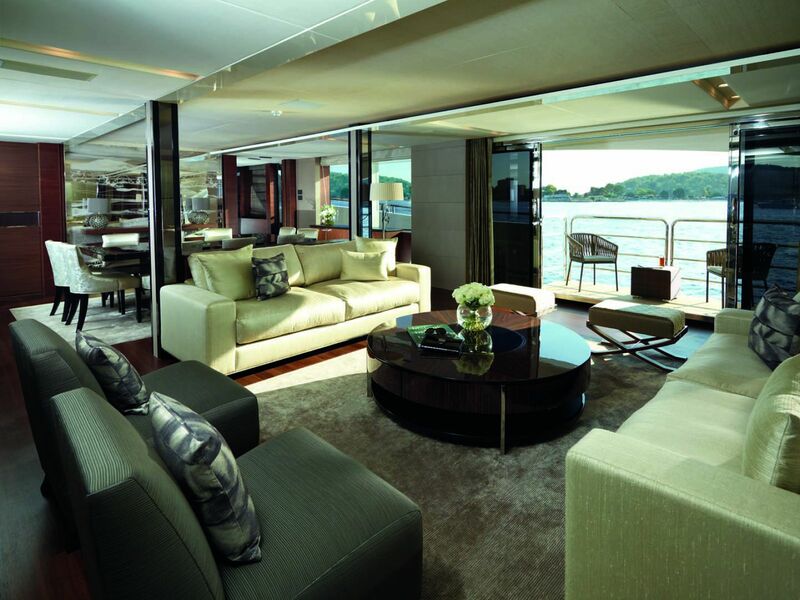 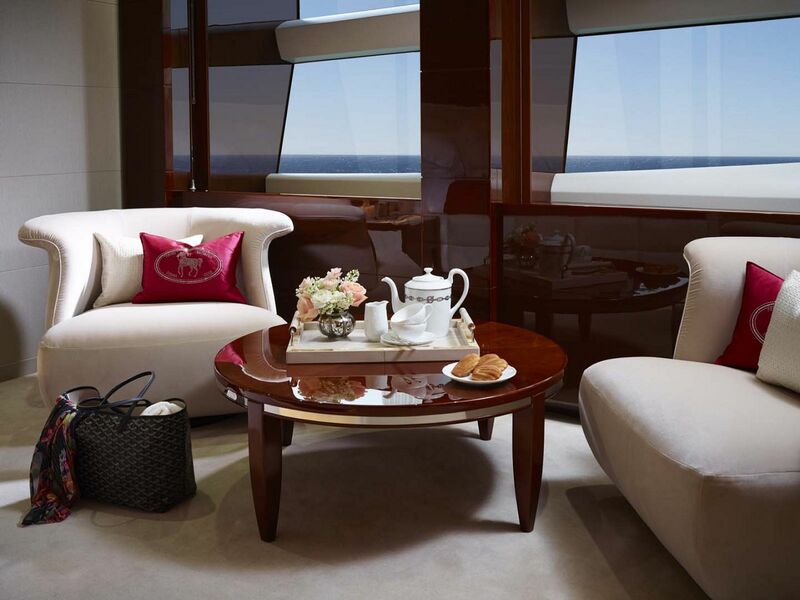 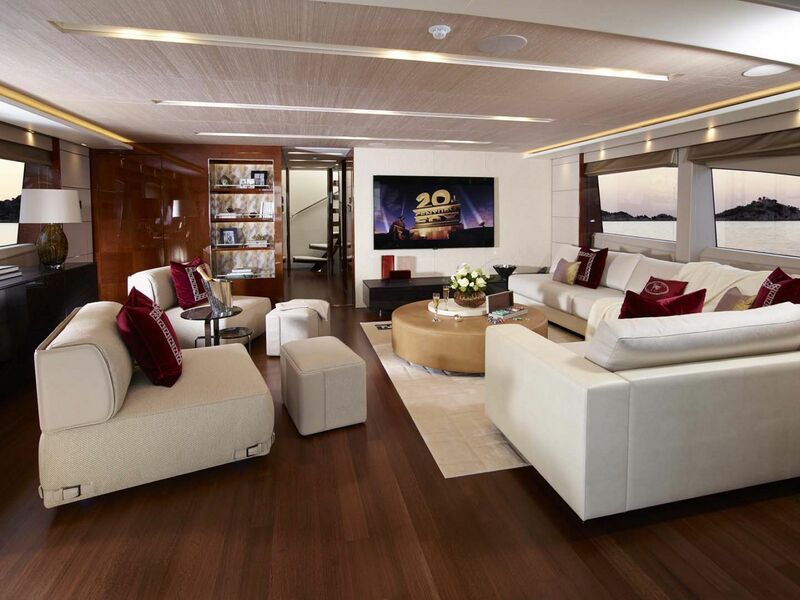 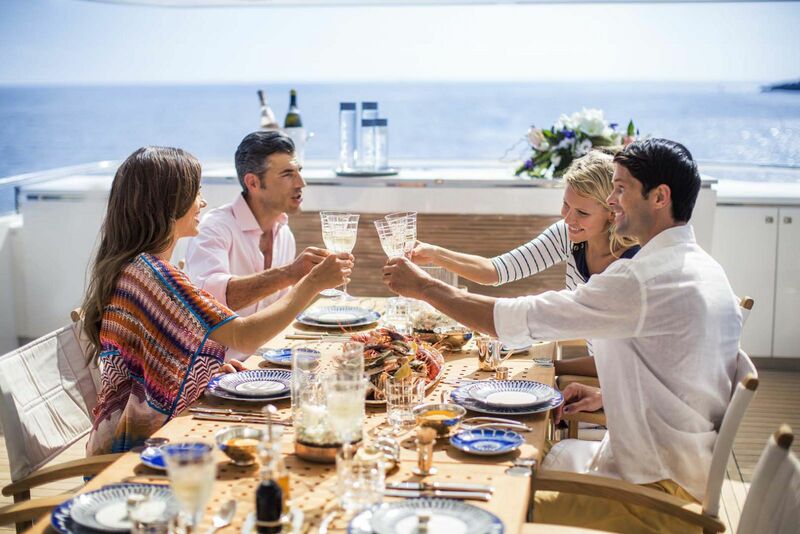 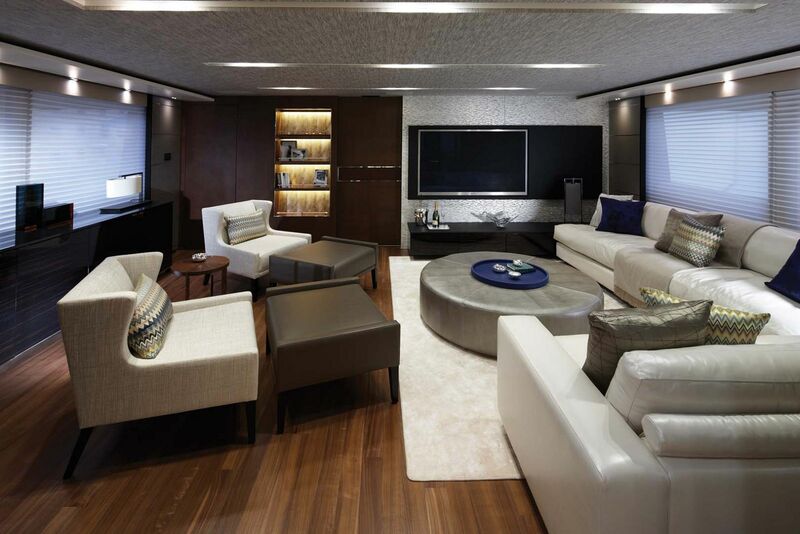 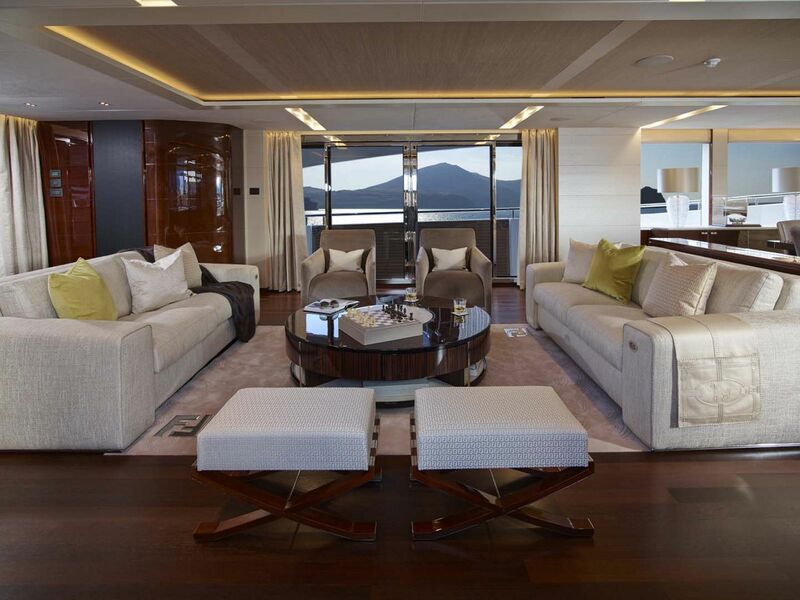 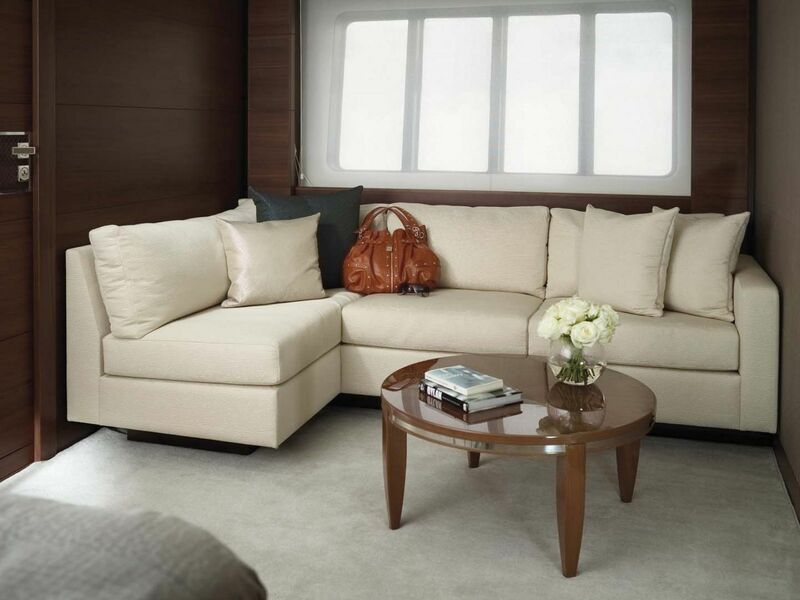 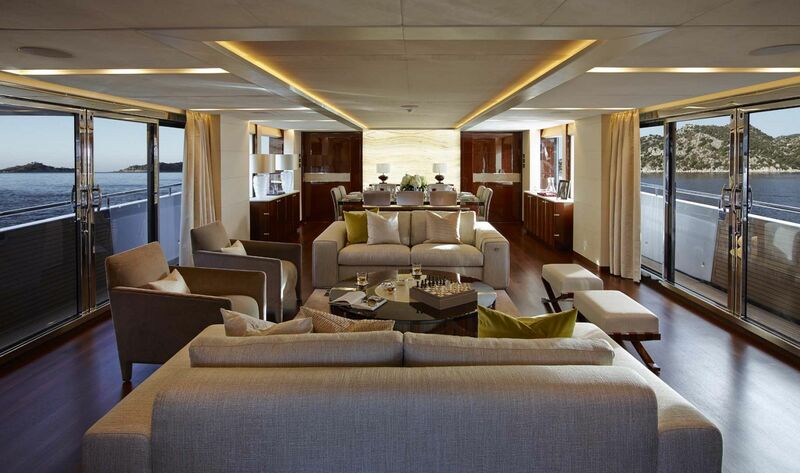 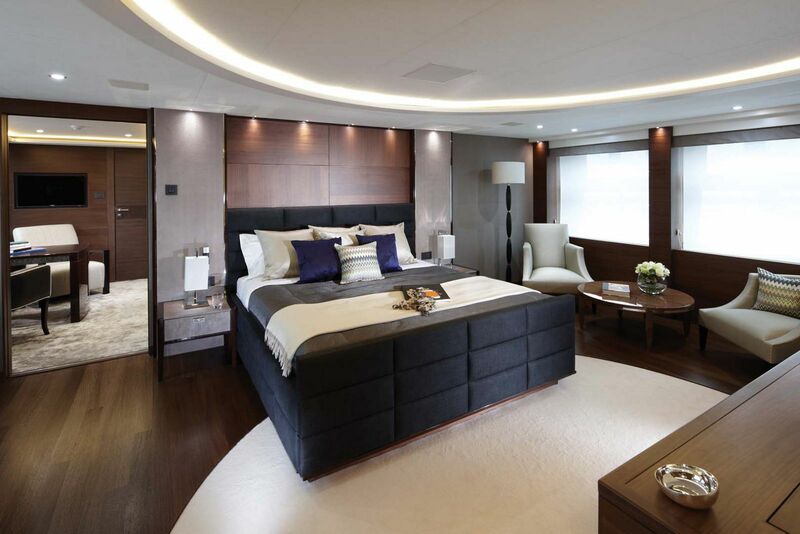 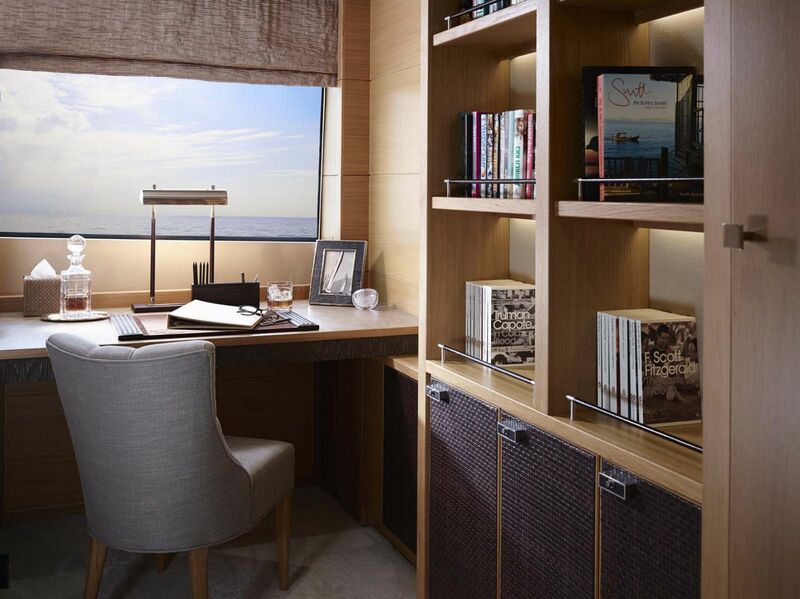 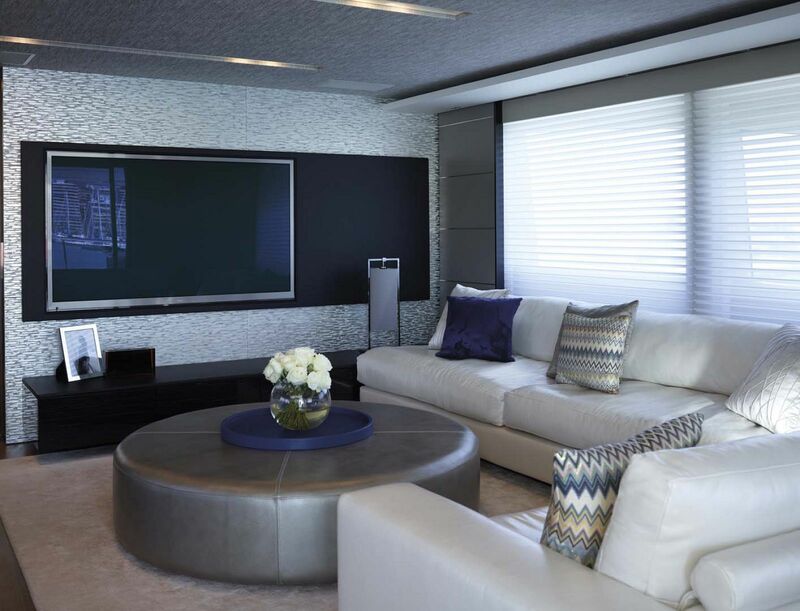 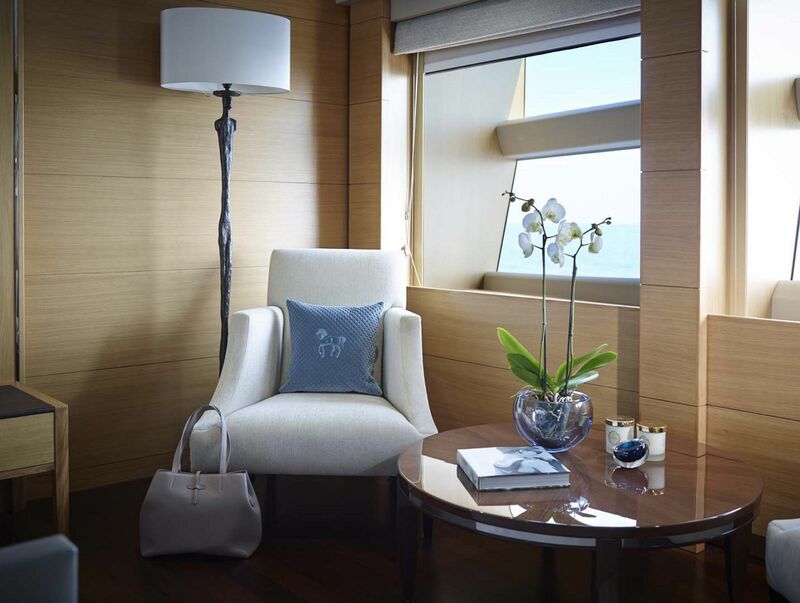 The owner’s suite is found forward on the main deck and stretches the entire beam. 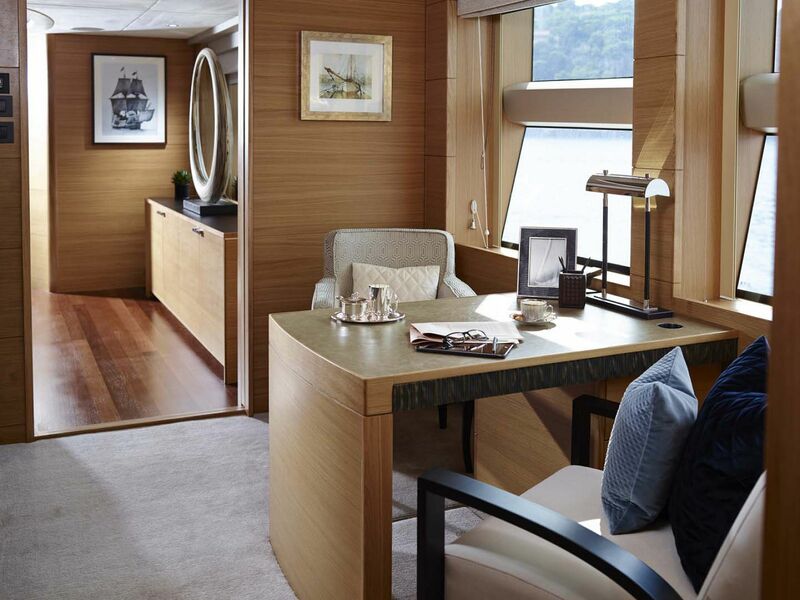 The master stateroom is almost 600 square feet and is lined with big windows and lots of room to walk around. 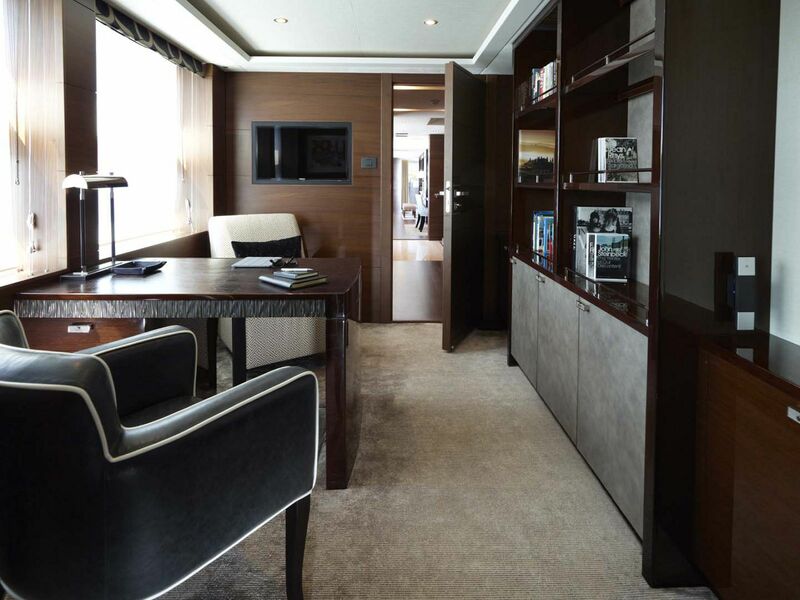 The king-sized berth is in the middle of the room in front of a hidden flatscreen television. 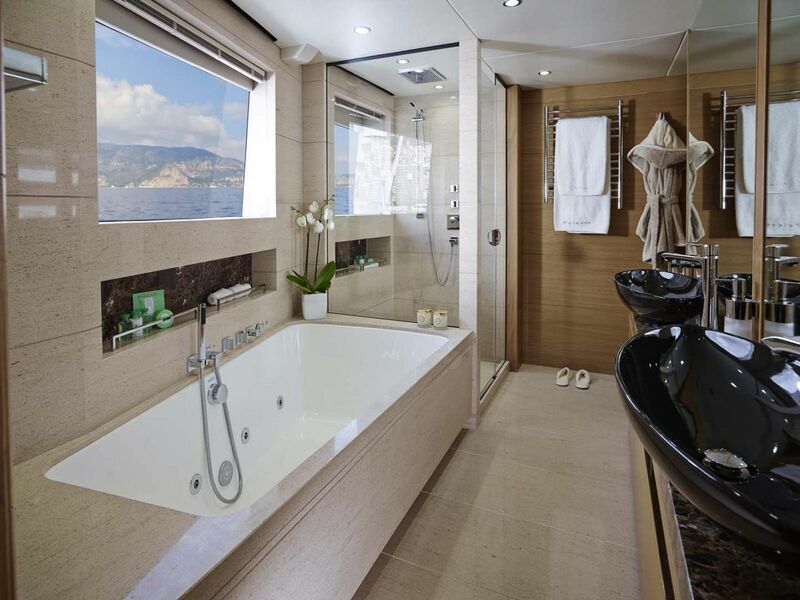 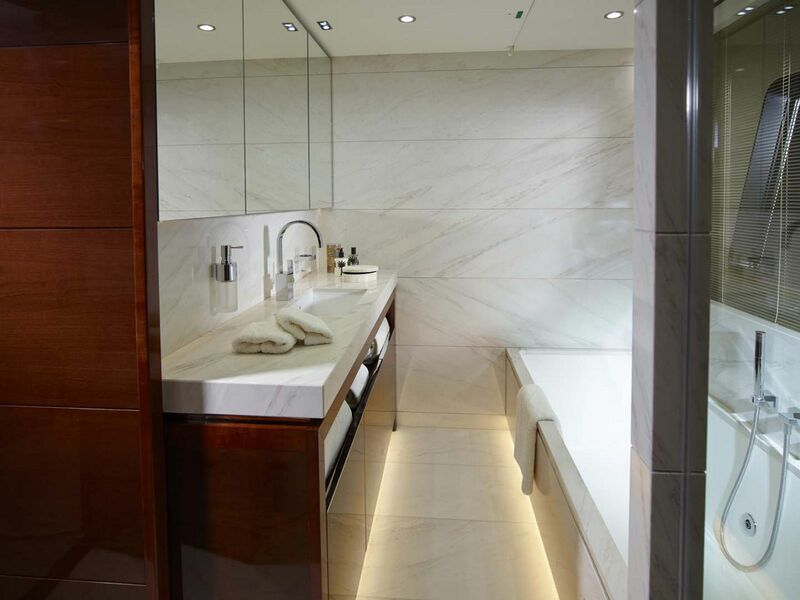 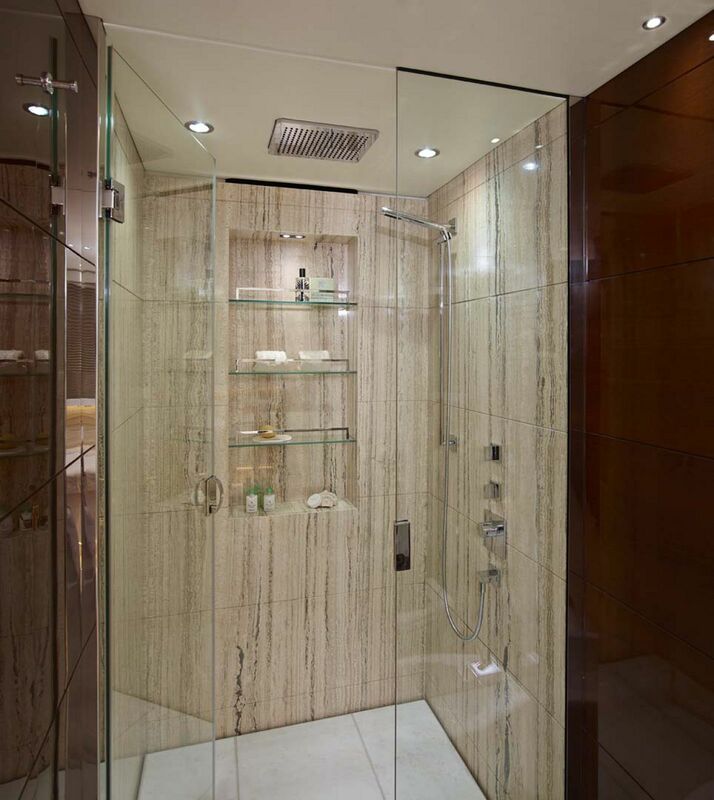 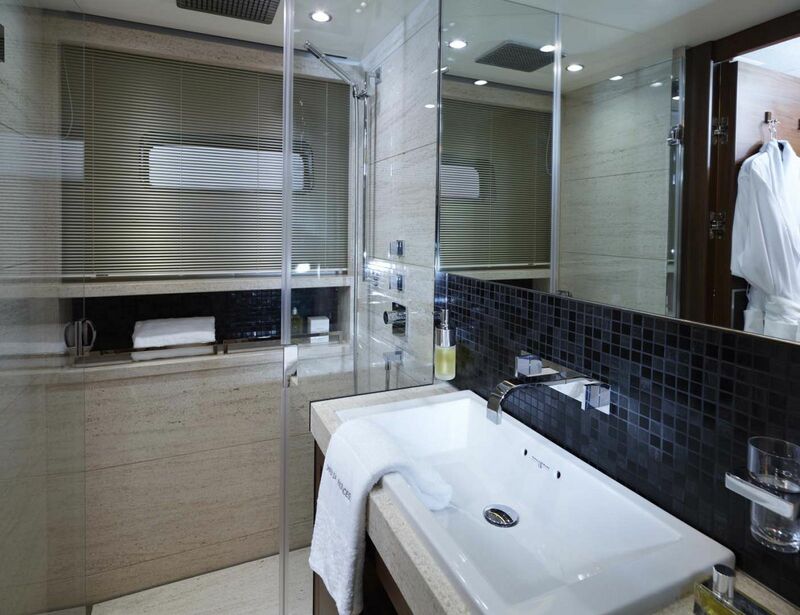 There are two separate heads inside the owner’s suite with separate sinks as well as a spa tub in one and a walk-in shower in the other. 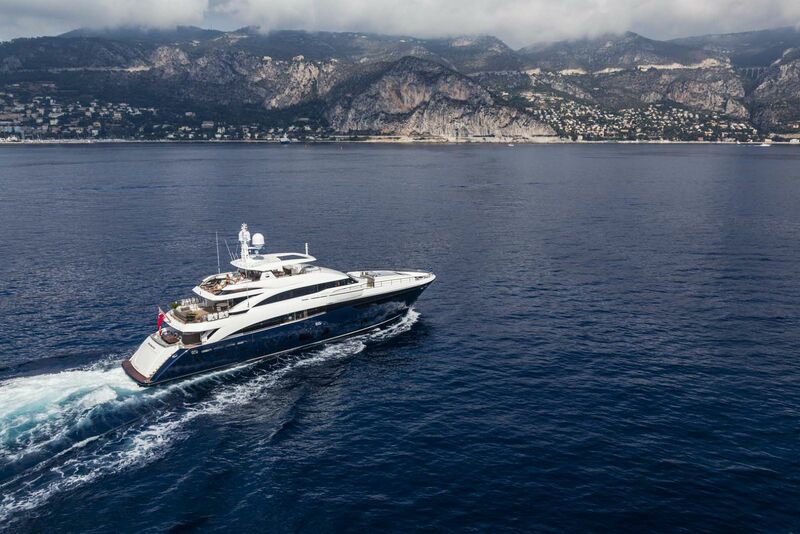 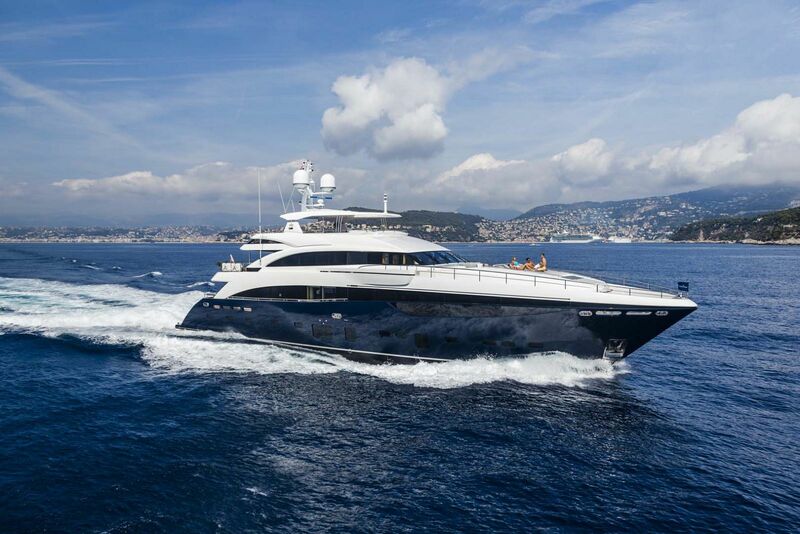 Princess chose a popular propulsion package for the 40M so owners could cruise comfortably and efficiently, but also have some speed if needed. 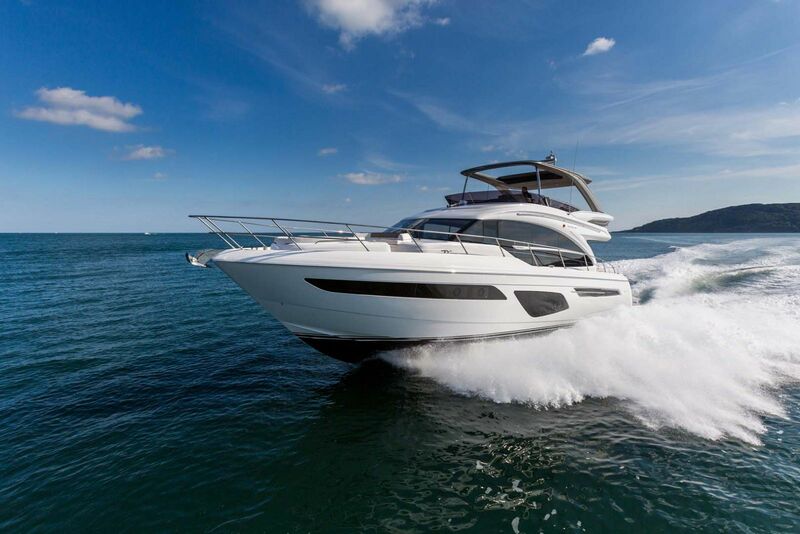 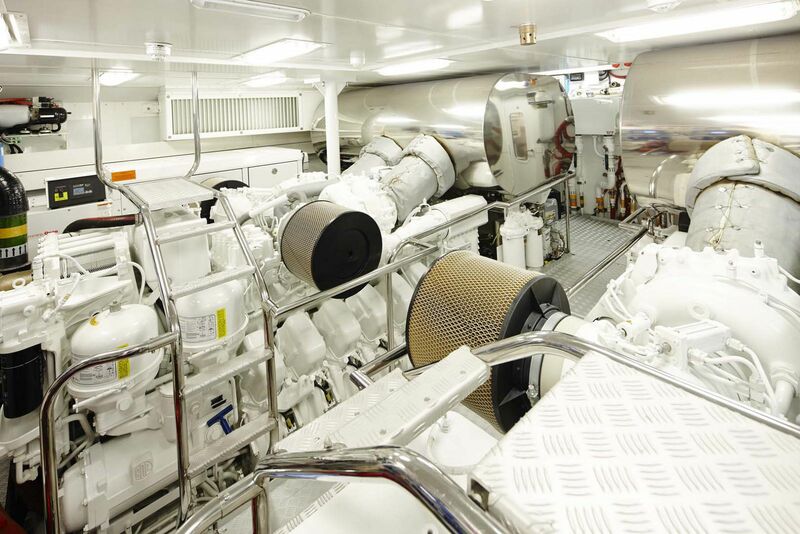 Twin MTU V12 4000 M93L 3508hp diesel engines power the 40M can cruise at 20-21 knots and reach a top-end speed of over 23 knots. 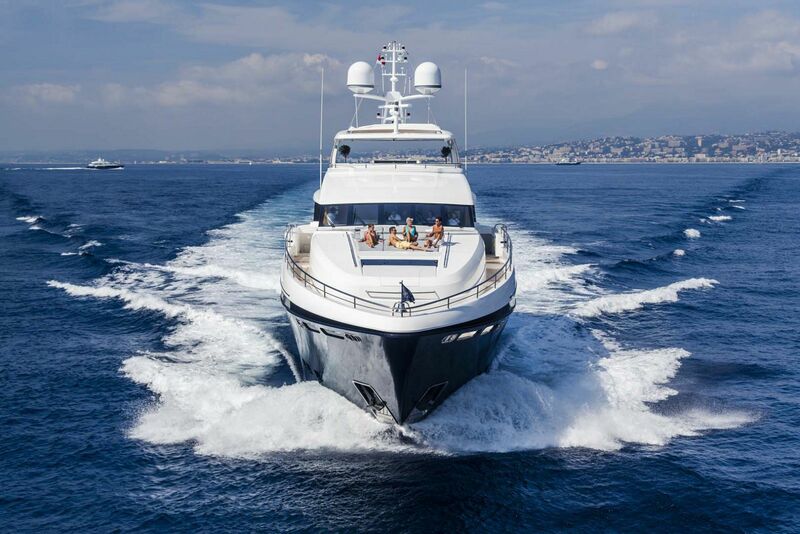 When dropped down to 10 knots, owners can expect a range of over 2,000 nautical miles. 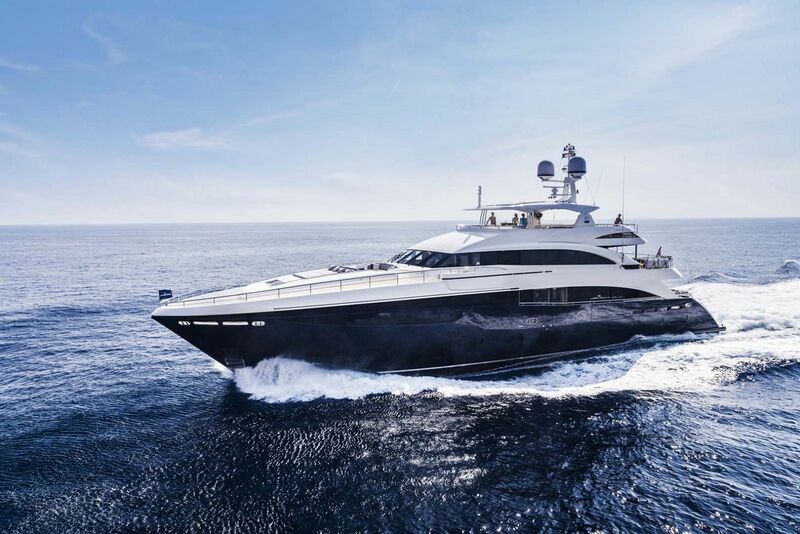 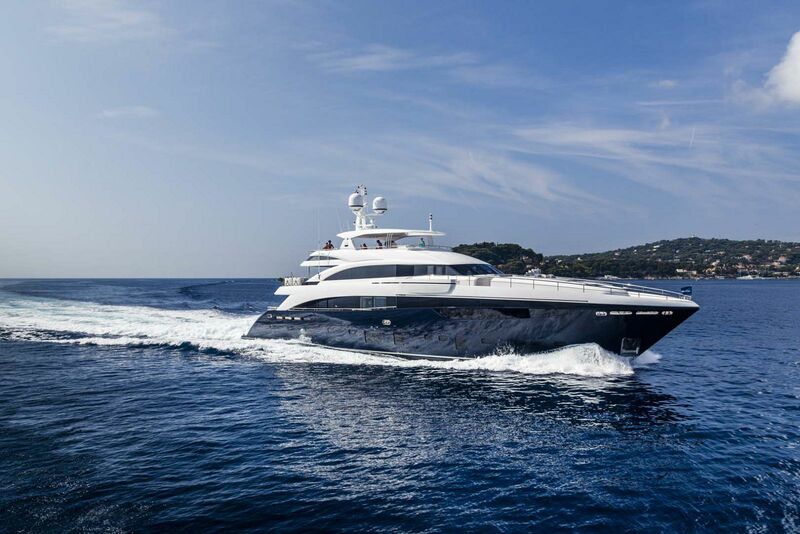 If you would like to receive more information on the Princess Yachts 40M Luxury Motor Yacht, please contact your Staten Island Yacht Sales Professional. 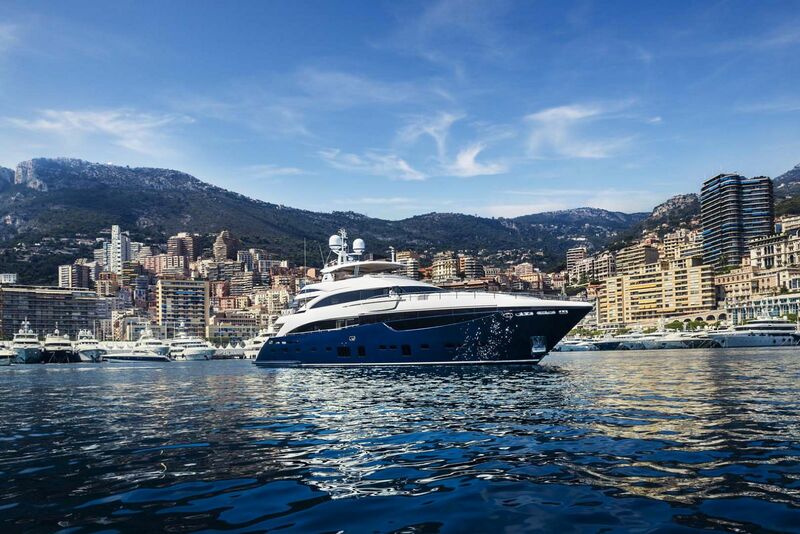 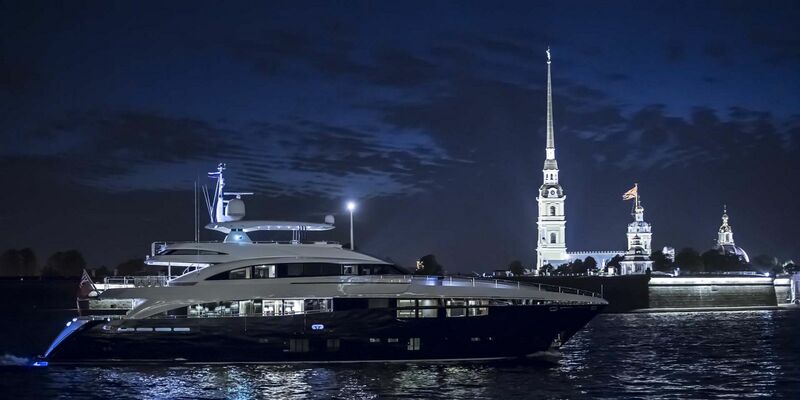 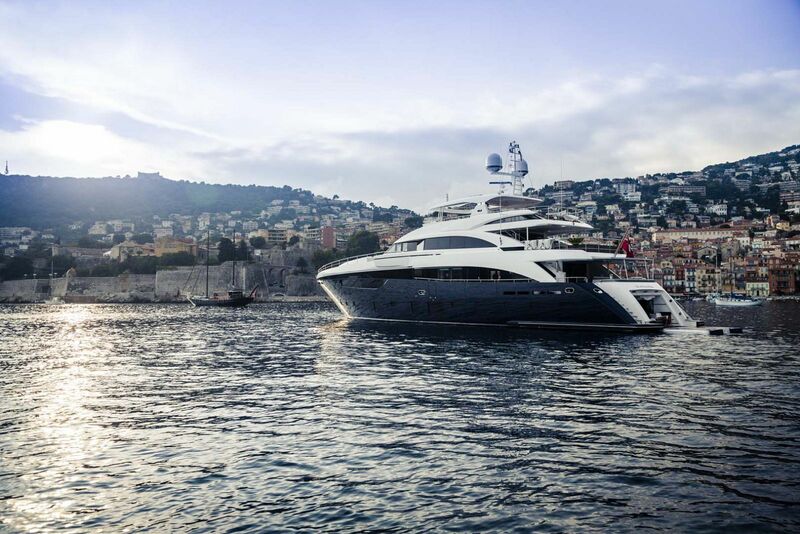 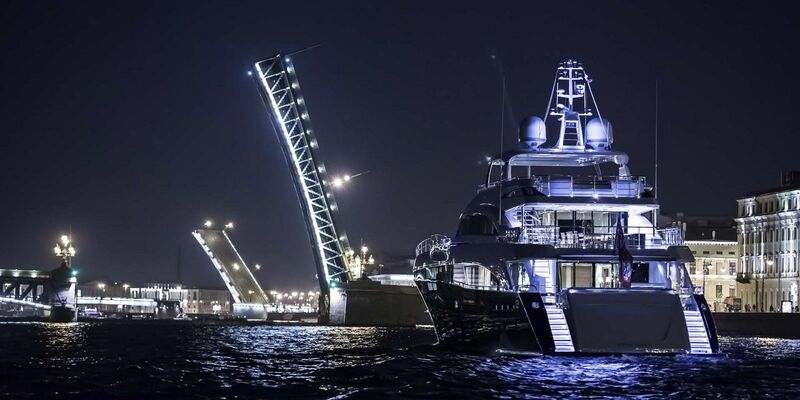 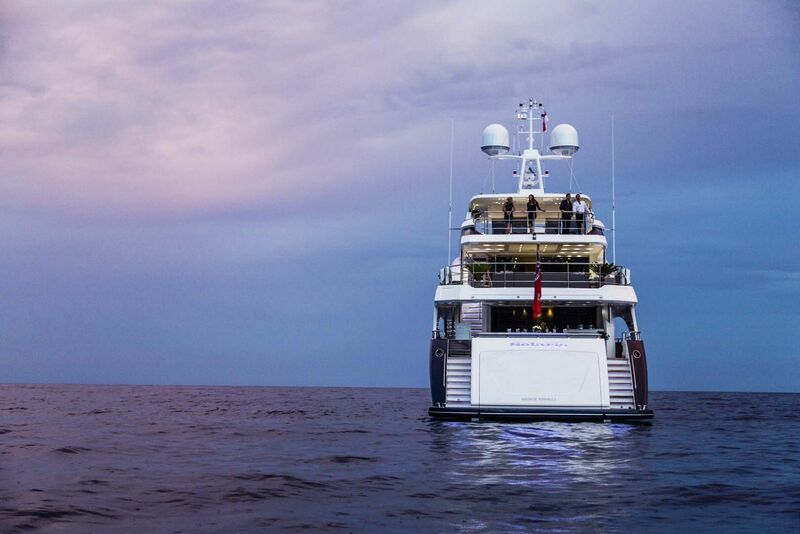 The 131-foot Princess Yacht Anka has an exterior as fearless as her interior is refined. 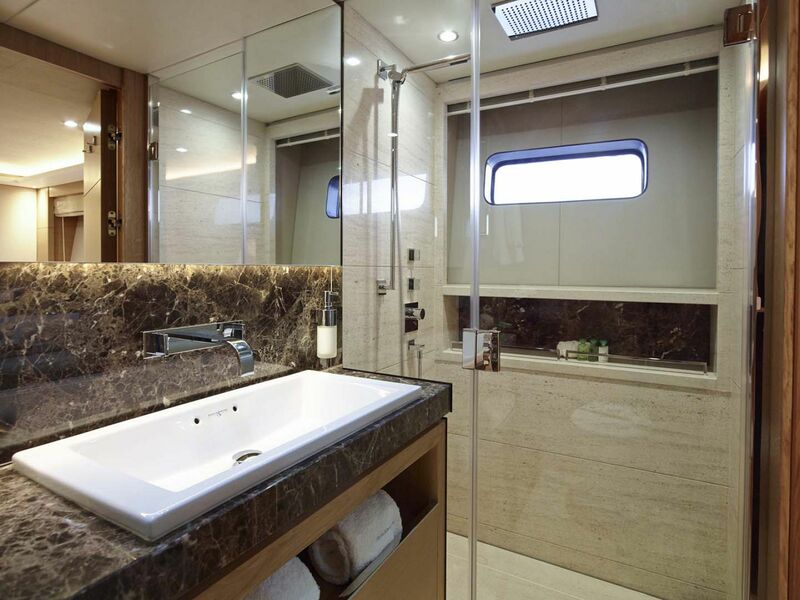 Princess Yachts released this virtual tour of the 40M Superyacht. 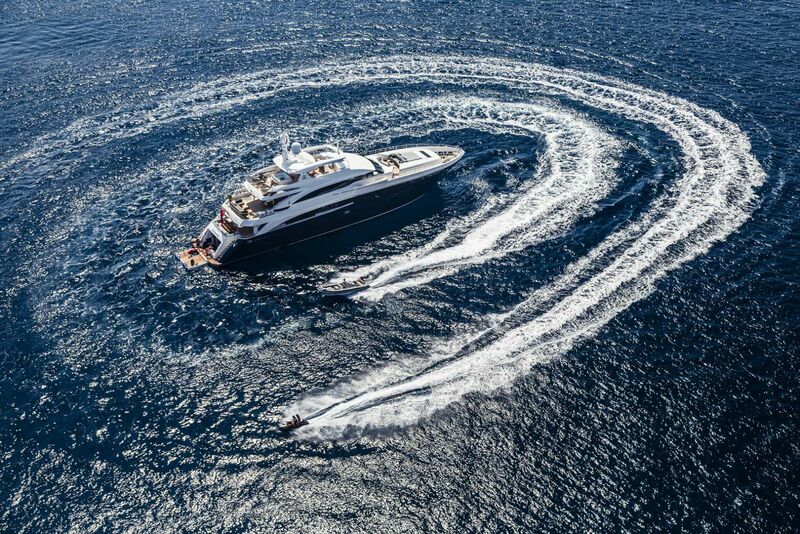 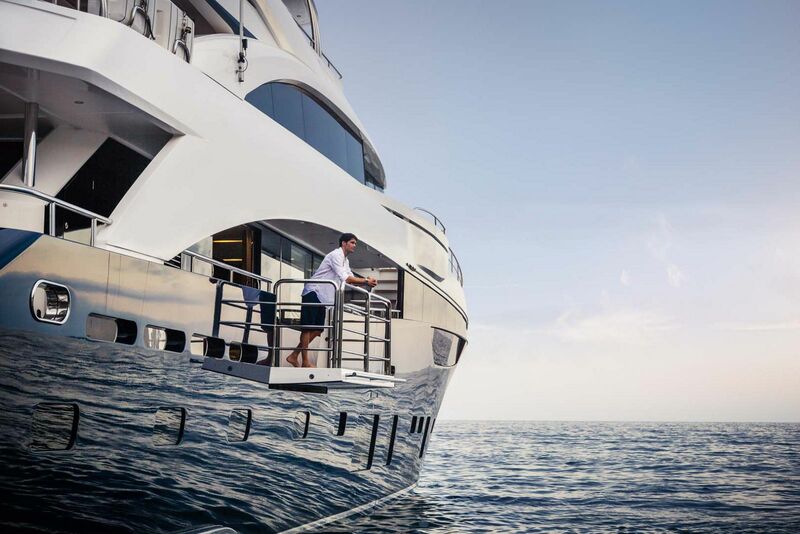 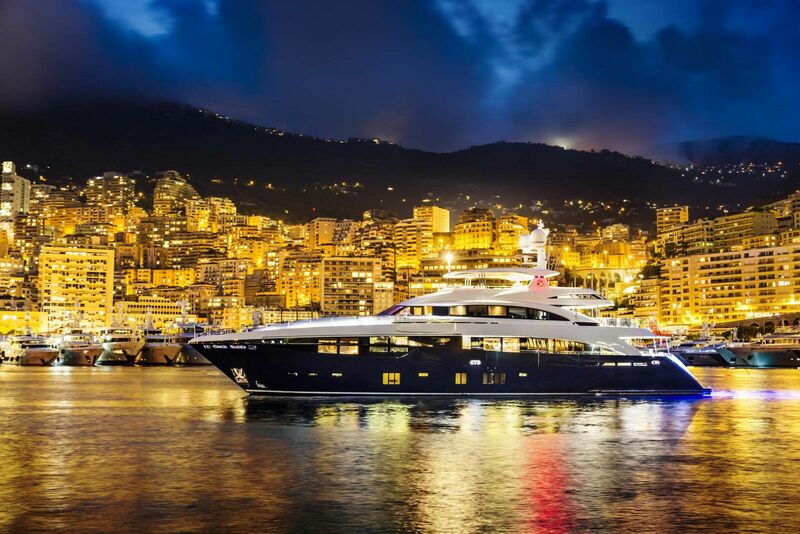 Princess Yachts releases this video trailer of the 40M Superyacht. 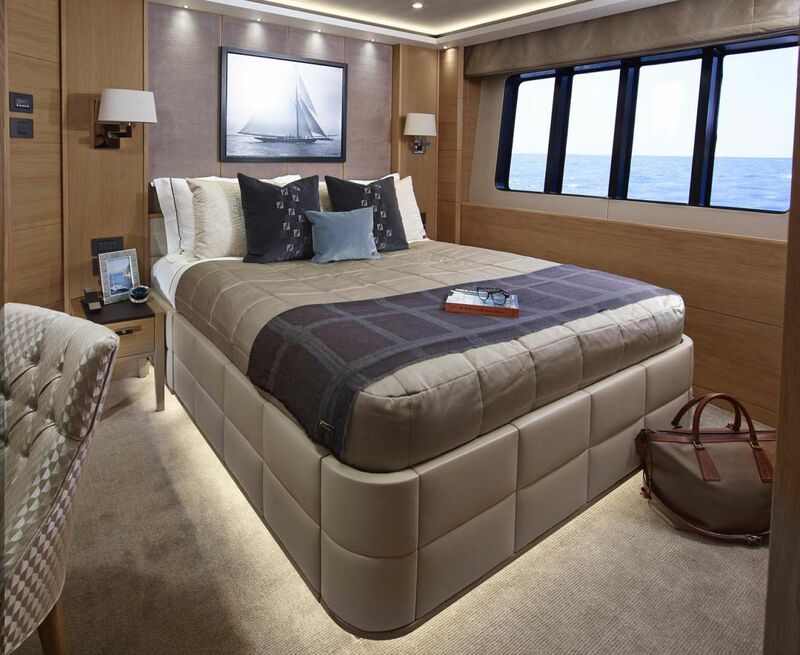 The story behind the amazing Princess 40M from the factory in Plymouth.